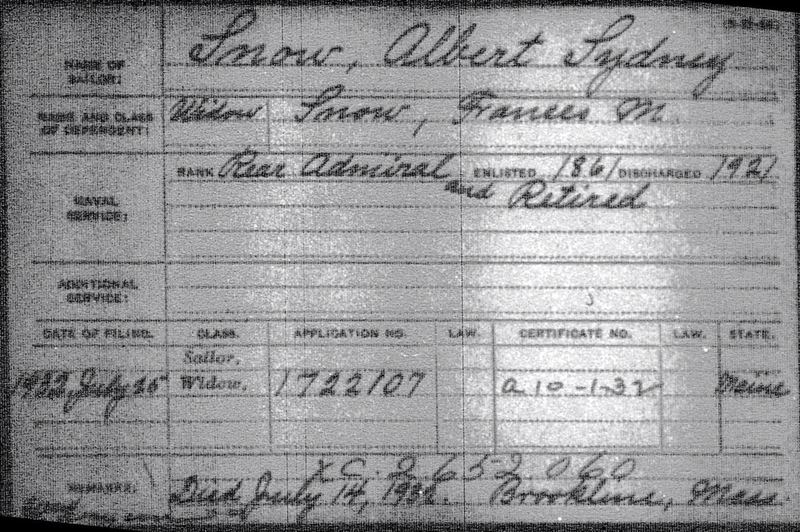 Unites States Navy Rear Admiral Albert Sydney Snow was born November 18th 1845 in Rockland, Knox County, Maine. 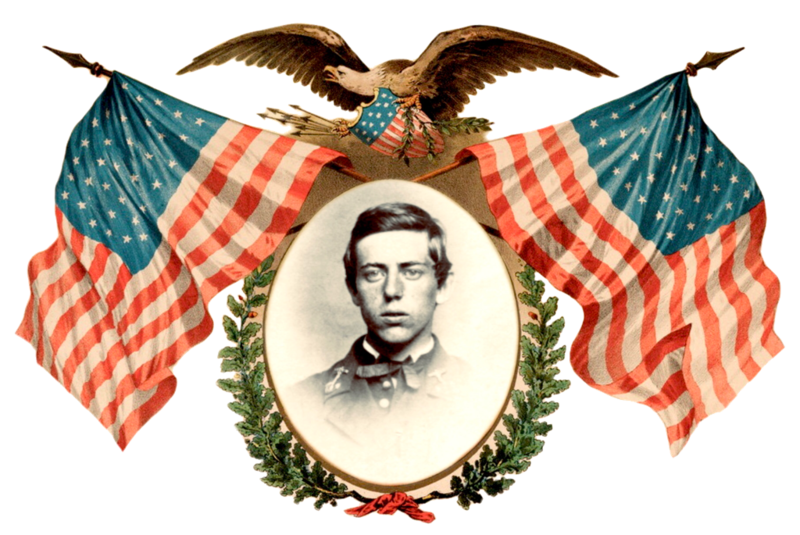 Albert was appointed Acting Midshipmen at the Naval Academy on November 30th 1861, subsequently the Academy had been moved from Annapolis, Maryland to Newport Harbor, Rhode Island in wake of Confederate threats at the commencement of the Civil War. 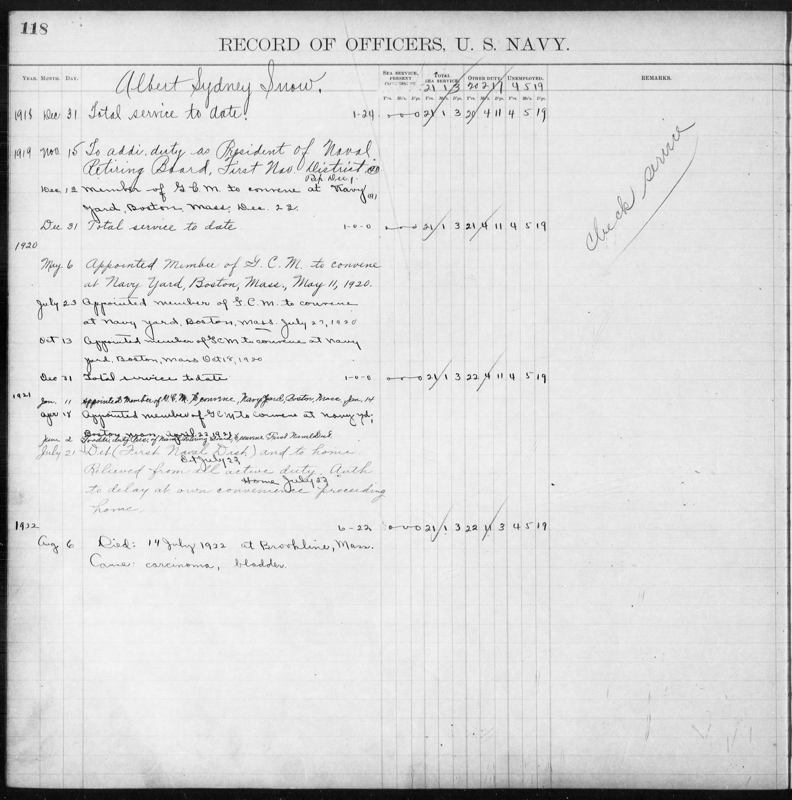 Albert was appointed Acting Midshipmen at the Annapolis Naval Academy on November 30th 1861, after the Academy had been moved from Annapolis, Maryland to Newport Harbor, Rhode Island. 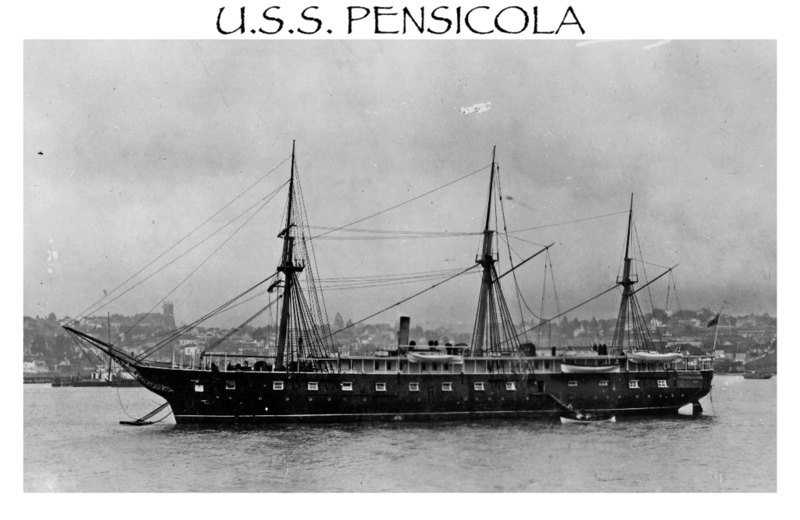 His class was initially housed and schooled aboard the famed frigate U.S.S. 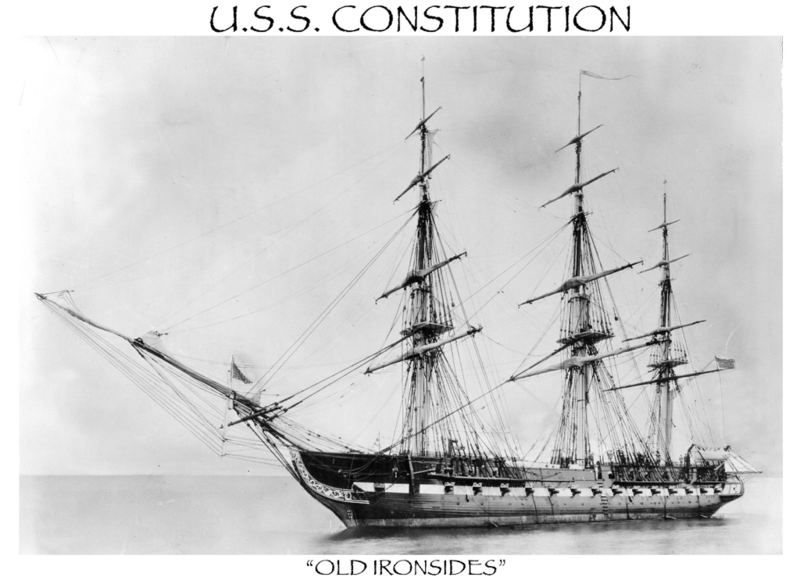 Constitution “Old Ironsides”. After it became clear that the War would draw out, the Navy ordered the Academy to prepare for a longer stay and lease one of the city’s hotels. 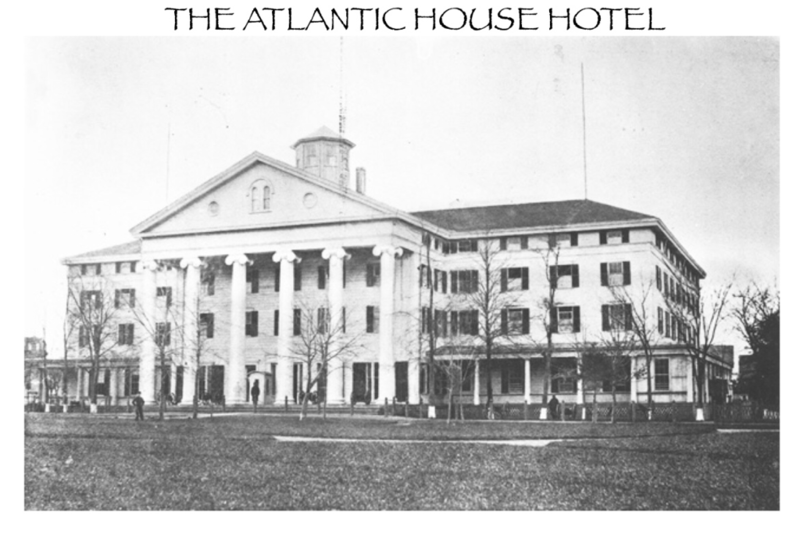 The Atlantic House, a hotel at the corner of Bellevue Avenue and Pelham Street was chosen for housing the Midshipmen. 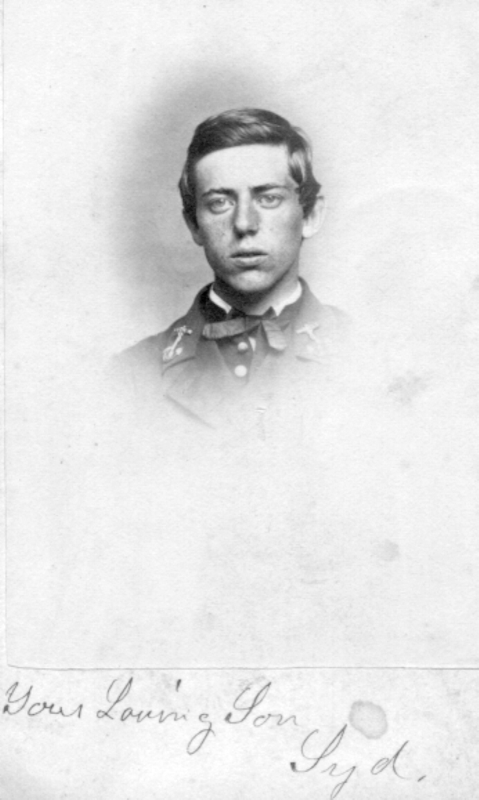 Albert was promoted to Midshipman on July 16th 1862. 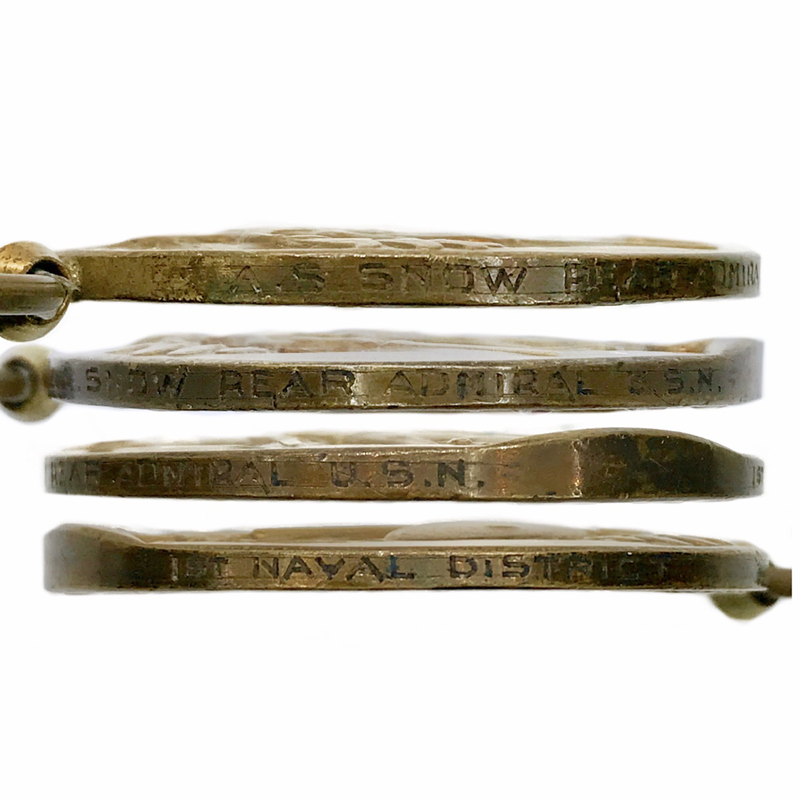 Midshipman Snow was transferred to the Naval Academy practice Sloop of War U.S.S. 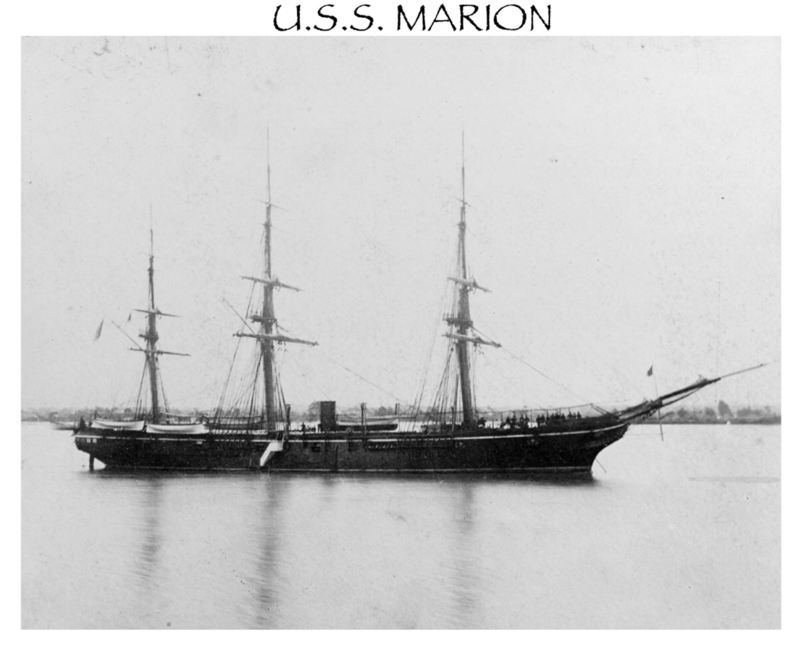 Marion as she sailed in the Summer Cruise of 1862. 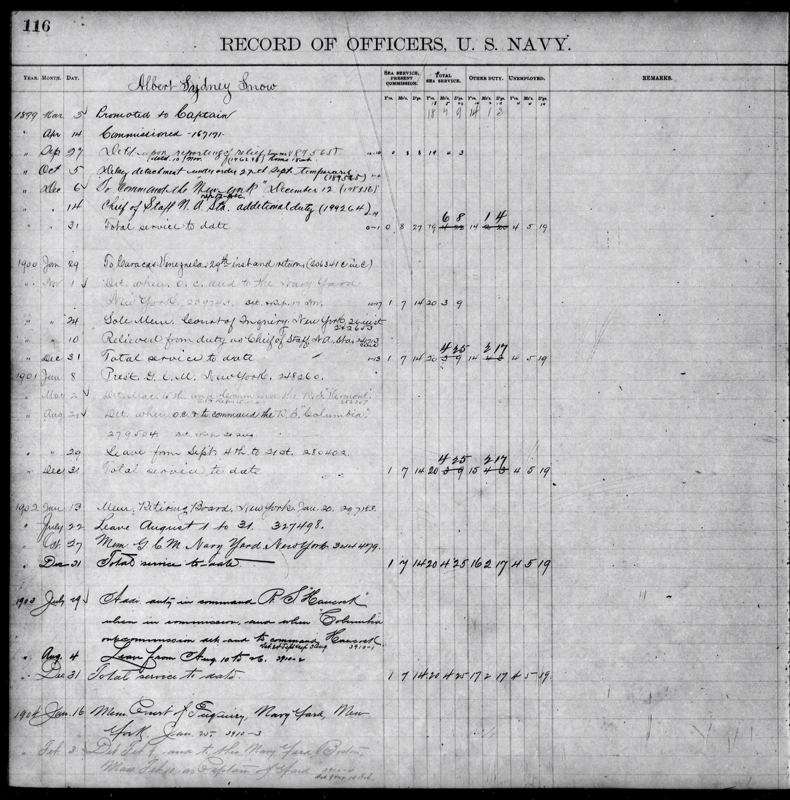 On 2 June 1864, the Gunboat U.S.S. 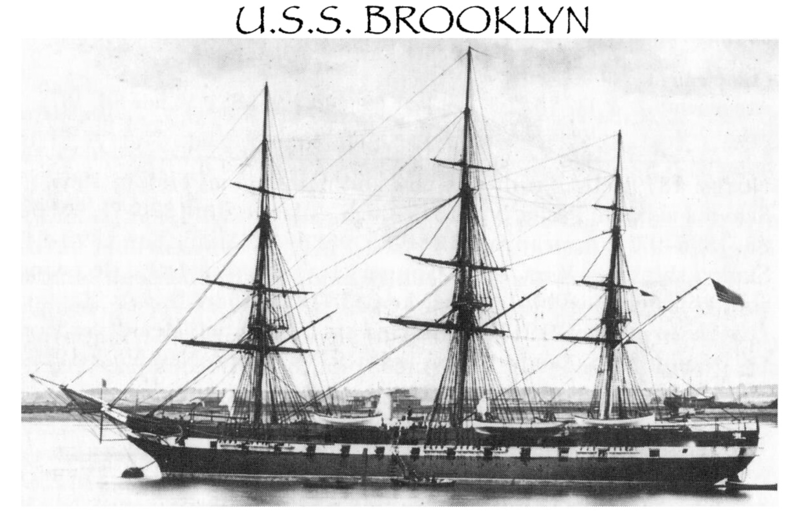 Marblehead was ordered to serve as a practice ship for the Naval Academy. Midshipman Snow sailed aboard the U.S.S. Marblehead for her summer cruise on June 13th 1864. The U.S.S. 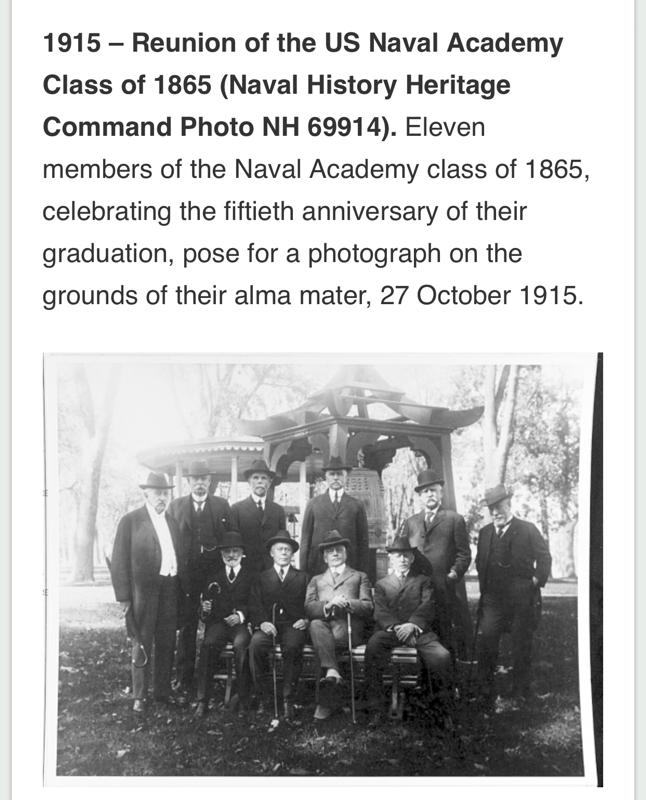 Marblehead’s Naval Academy service was interrupted when Midshipmen Snow and the crew of the U.S.S. 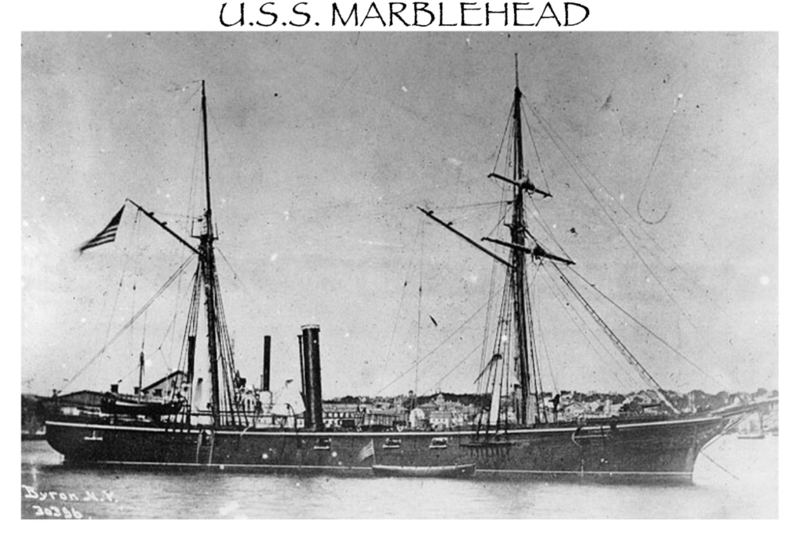 Marblehead were put into active service, The U.S.S. Marblehead resumed coastal patrol duties from Newport to New London and Gardiner’s Bay pursuing the Confederate Steamers Florida & Tallahassee. Midshipman Snow was transfer from the U.S.S. Marblehead on July 7th to the Naval Academy practice Frigate U.S.S. Macedonia at Gardiner’s Bay. For the next 2 months the Midshipman Snow and the U.S.S. 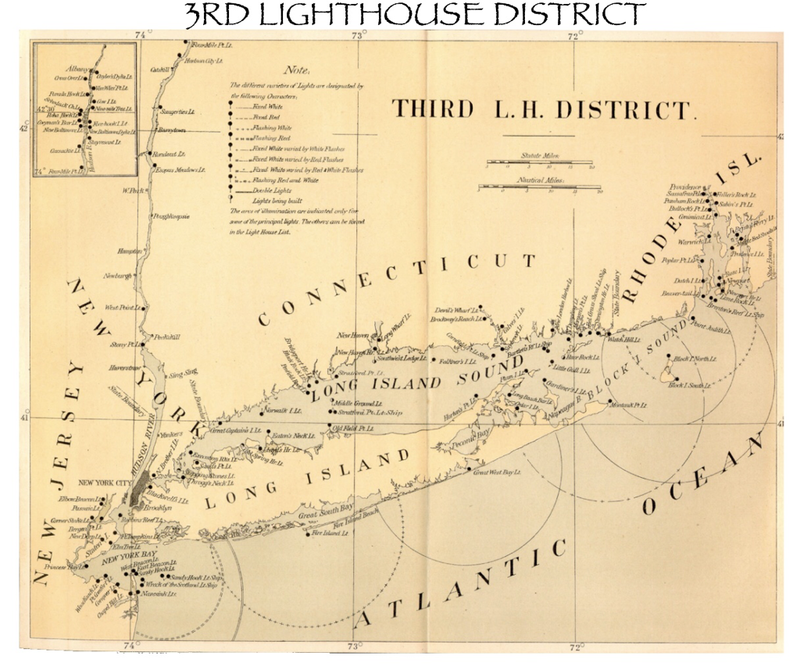 Macedonia cruised along Montauk Point, Block Island, Long Island Sound, New Bedford Harbor, Buzzard’s Bay, Point Judith, New London Harbor, and Newport, ending the cruise on September 30th, 1864. 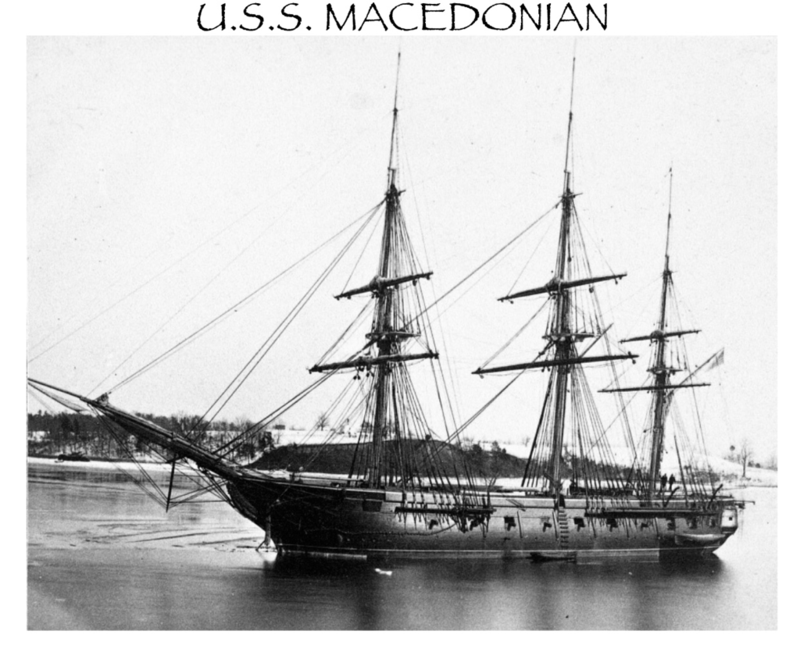 Midshipman Snow was stationed aboard the Naval Academy practice Mohongo-Class Gunboat U.S.S. 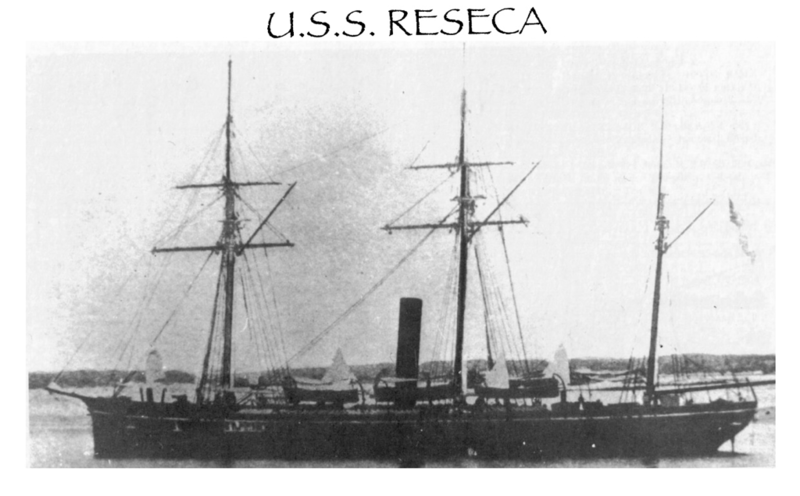 Winnepec during her Summer Cruise in 1865. 10th 1865 after the Academy had been relocated back to Annapolis, Maryland. 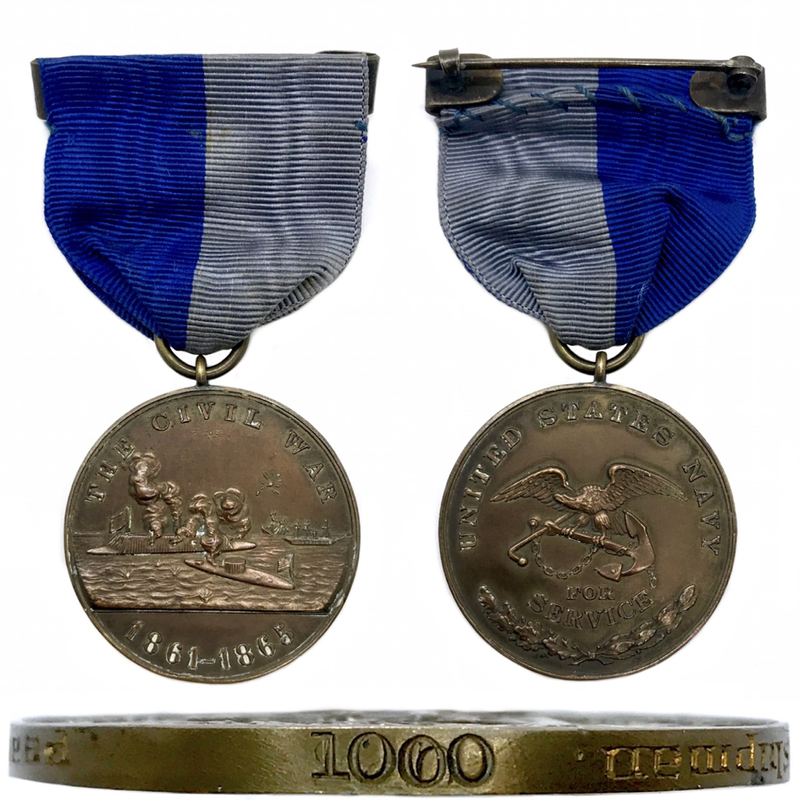 ​was issued Campaign Medal #1000. Master Snow was then promoted to the rank of Lieutenant on March 26th 1869. His new orders brought him to the screw sloop-of-war U.S.S. 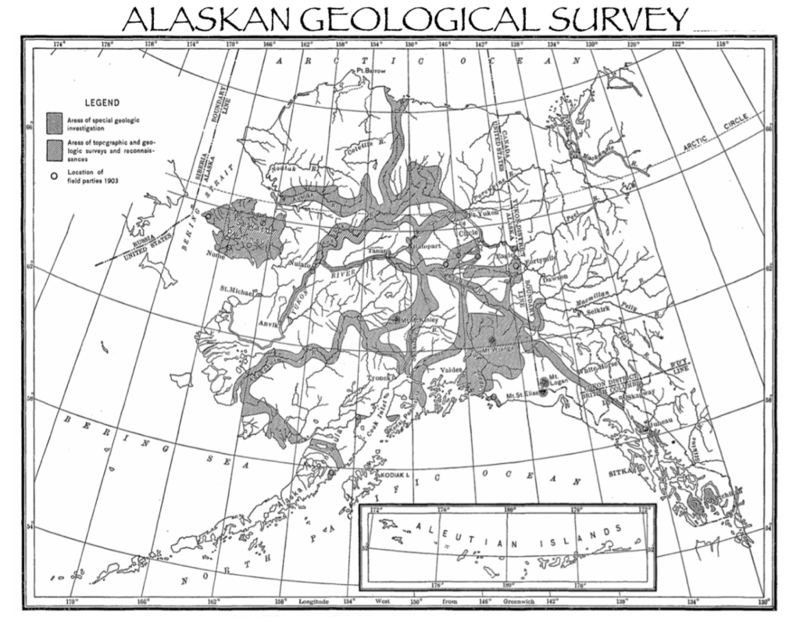 Alaska on November 25th 1869. 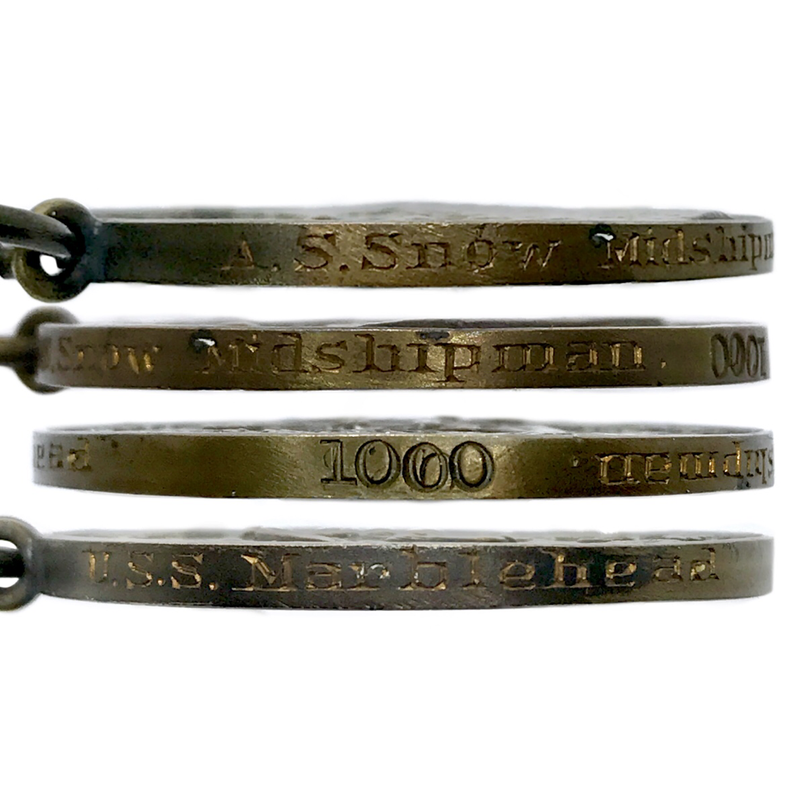 Lieutenant Snow would soon see Action in 1871 aboard the U.S.S. Alaska. 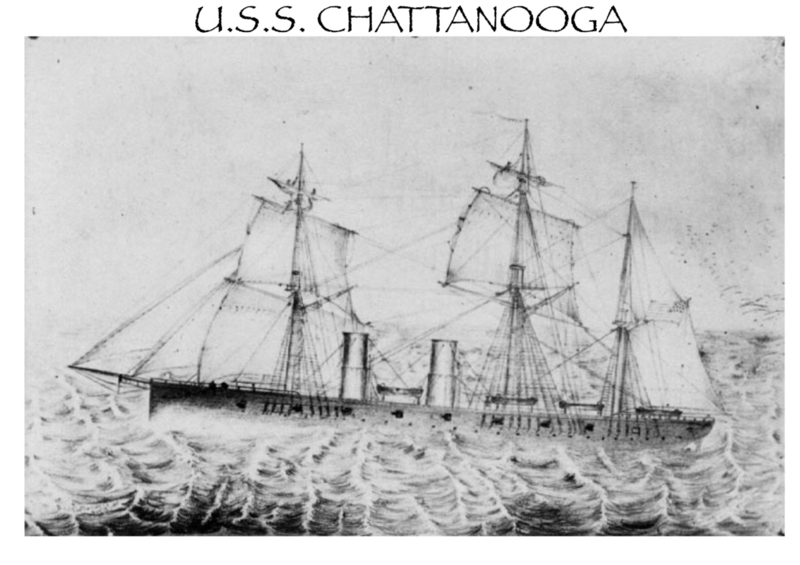 An American fleet led by a diplomatic and merchant ship entered Korean waters and were fired upon by antiquated shore batteries. In response 5 warships, the U.S.S. Colorado, U.S.S. 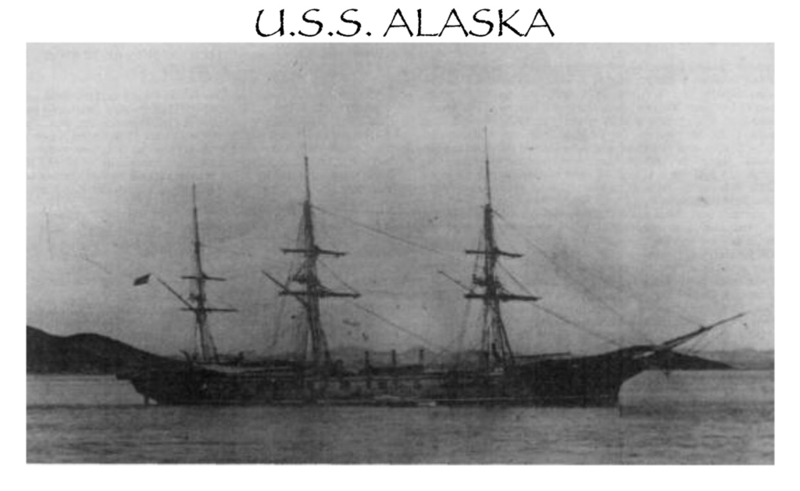 Alaska, U.S.S. Palos, U.S.S. Monocracy, U.S.S. 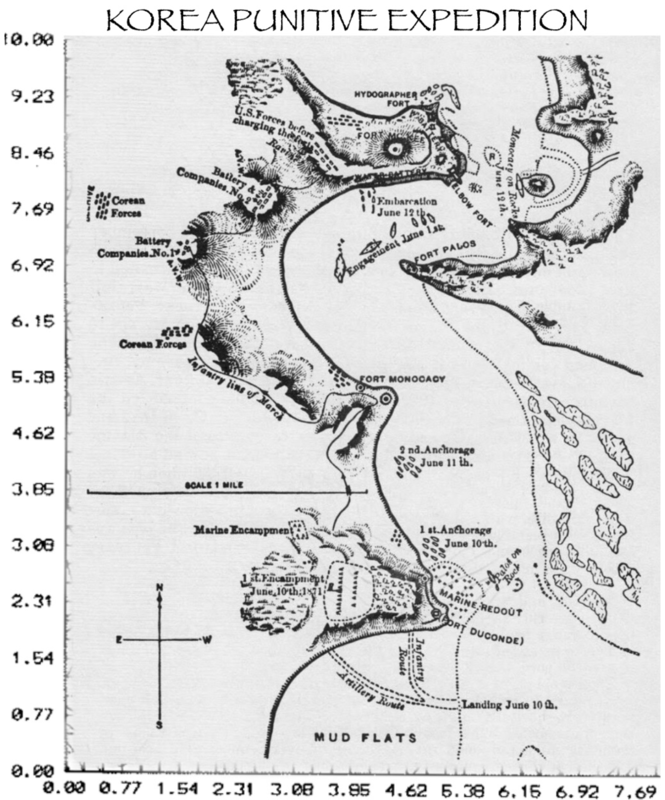 Benicia, and approximately 650 Marines and Sailors, nearly all the men of the expedition, attacked one fort after another, pushing the Korean forces back and inflicting heavy casualties while suffering relatively little in return. 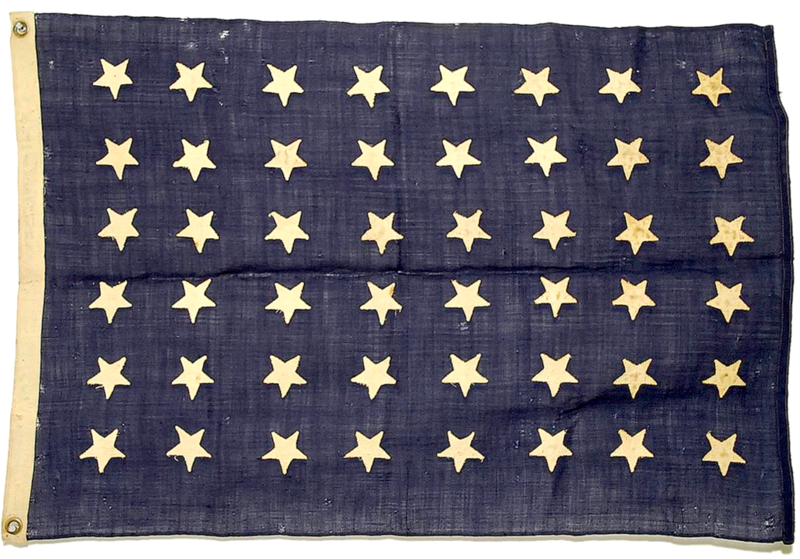 The fighting was over before nightfall, but the American forces achieved a dramatic success. They captured five forts, killed 243 Korean troops, and suffered only three deaths and little damage to equipment. The Koreans refused to enter negotiations with the Americans, and simply closed themselves back off for another two years. 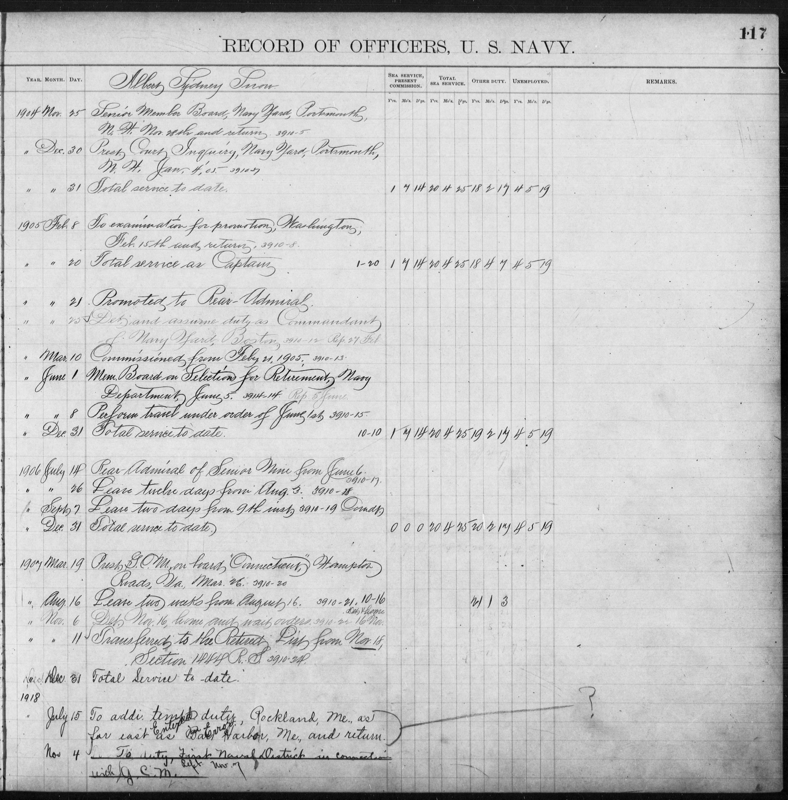 From August 4th 1873 through September 24th 1873 Lt Snow attended the newly developed Torpedo Class and Torpedo Duty. He was transfer to the U.S.S. Brooklyn on November 25th 1873. ​On March 16th 1874 Lt. Snow was transferred to the Screw Sloop U.S.S. 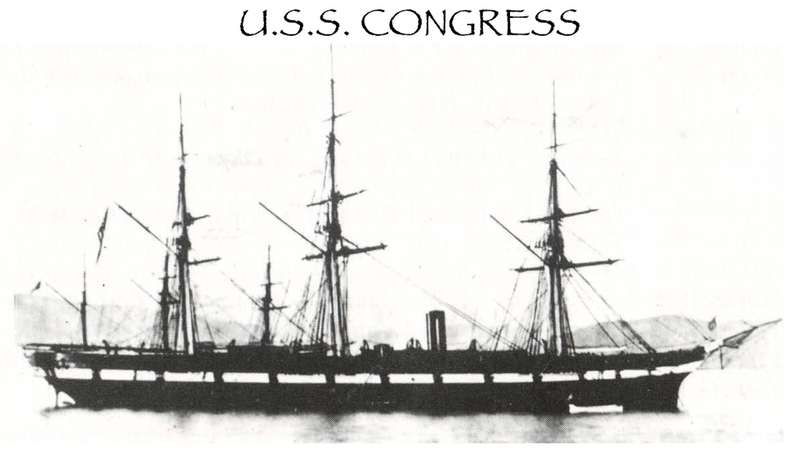 Congress as she sailed for the Mediterranean on April 9th 1874. The U.S.S. 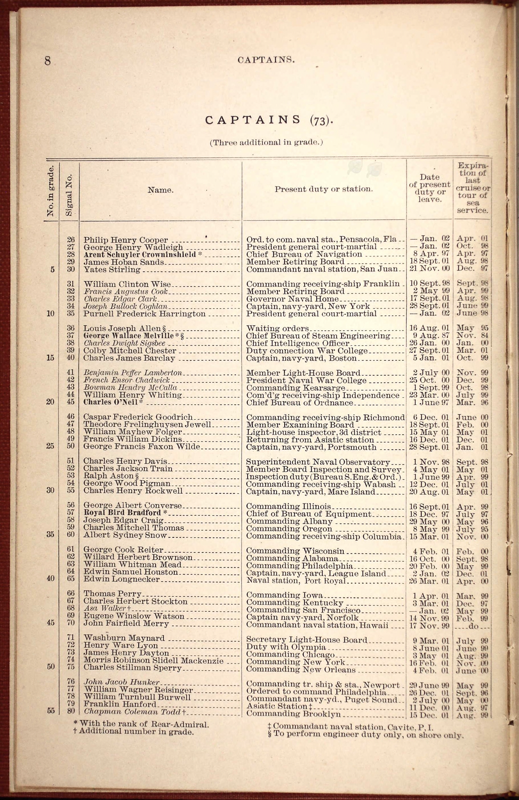 Congress visited ports on the coasts of Africa and Europe over the next 2 years before returning to Philadelphia to visit for the Centennial Exposition of 1876. 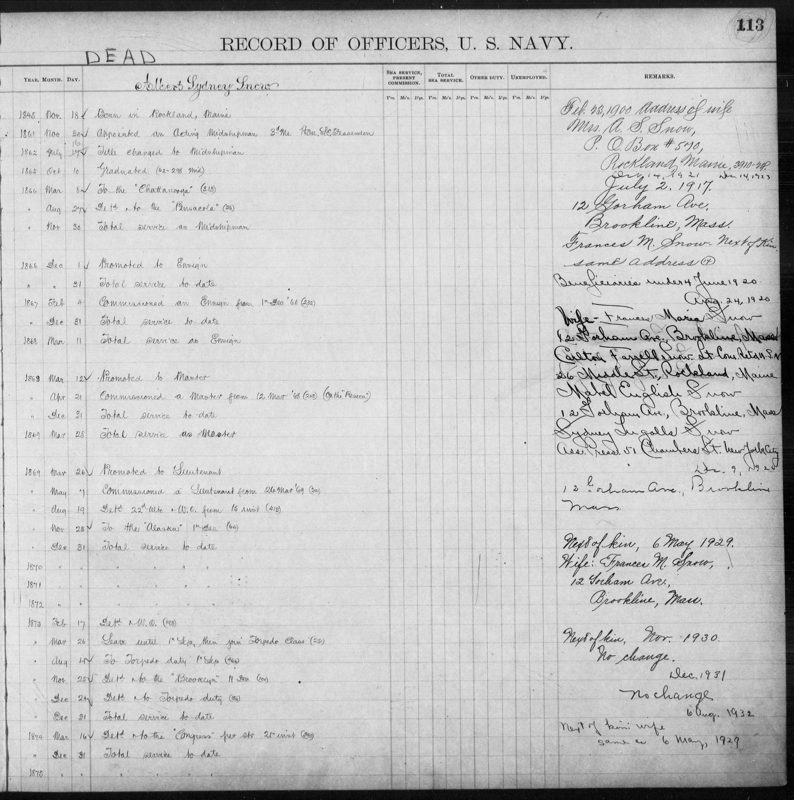 ​On January 7th 1879 Lieutenant Snow was made Executive Officer "XO" of the U.S.S. 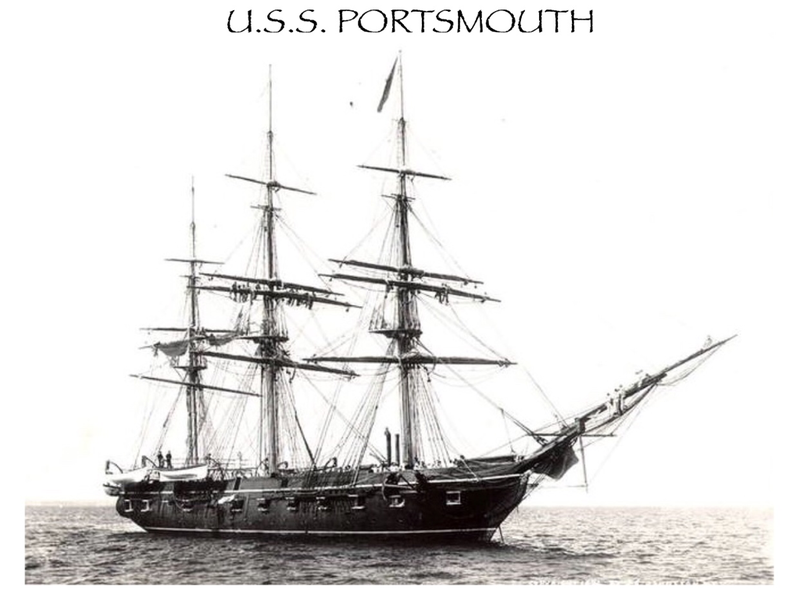 Portsmouth while it was used as a training ship. 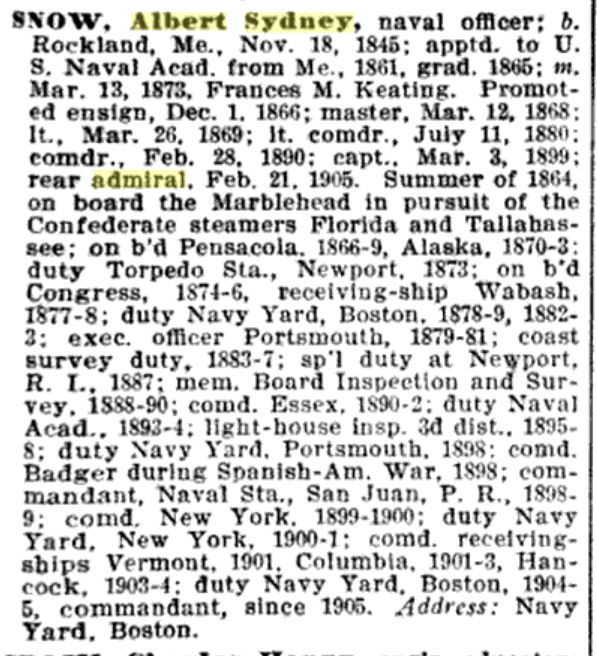 He was promoted to Lieutenant Commander on July 11th 1880, and he was transfer back to the Boston Naval Yard on May 13th 1882. ​Lt. Cmdr. 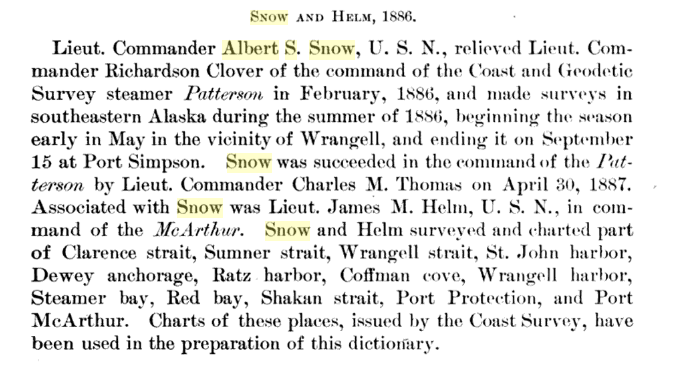 Snow attended special duty at Newport from August 22nd through September 1st 1887. Snow then attended the War College from September 6th through December 14th 1887. 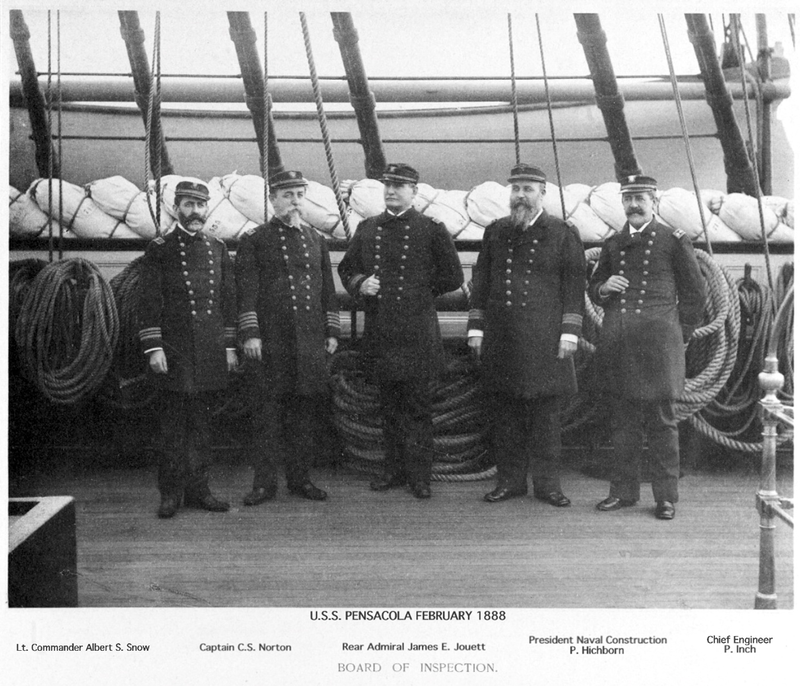 He served on the Member board of inspection from December 14th 1887 through April 1st 1890 while he rubbed shoulders with legends like Admiral George Dewey. 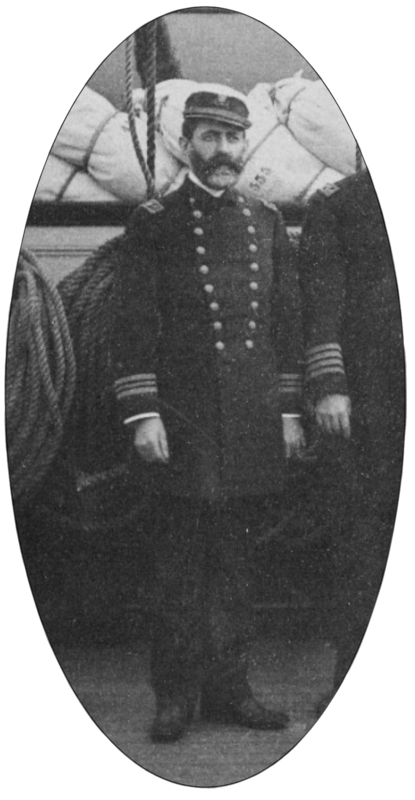 Lieutenant Snow was promoted to the rank of Commander on February 28th 1890 and transferred to command the Steam Sloop-of-War U.S.S. 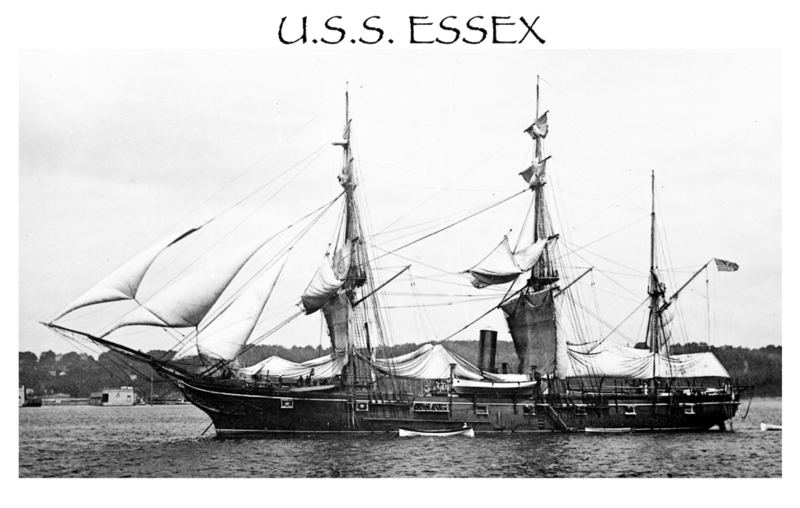 Essex on April 2nd 1890 while it was moored at the Portsmouth, New Hampshire, Naval Yard being prepared as a Naval Academy training ship. 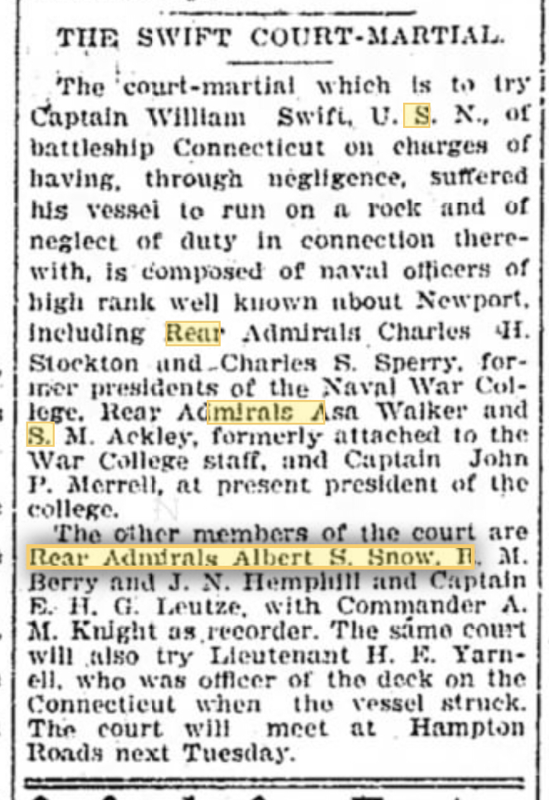 On May 19th 1893 Commander Snow was transferred to the Naval Academy as a Senior Board Member. 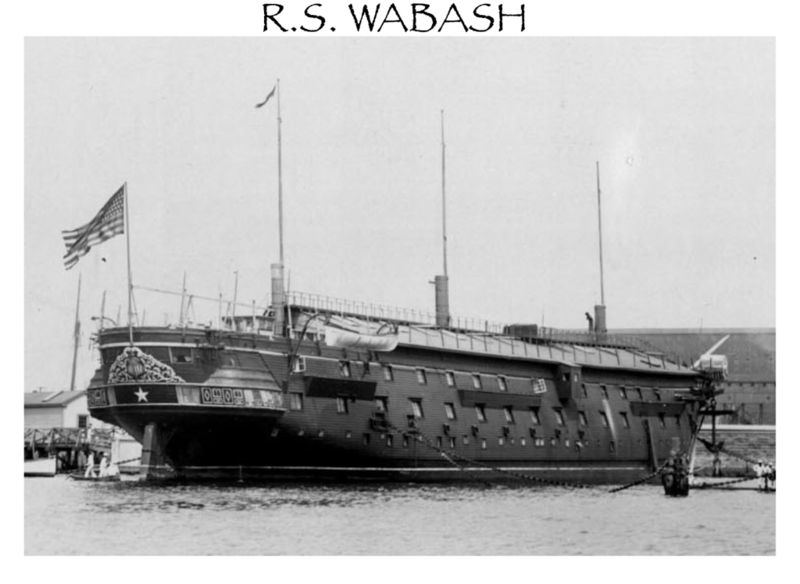 On July 27th 1893 Commander Snow took command of the Naval Academy practice Gunboat U.S.S. 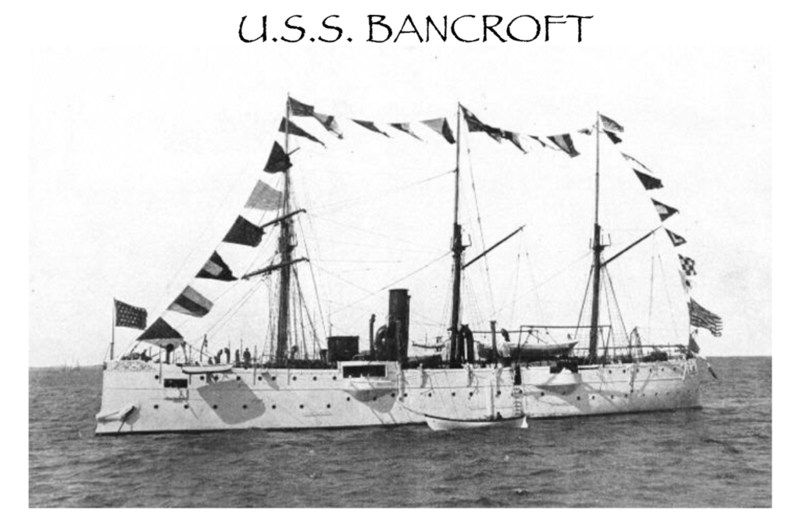 Bancroft as she cruised along the east coast visiting various shipyards with groups of midshipmen embarked. Commander Snow was transferred from the U.S.S. Bancroft on June 12th 1894. 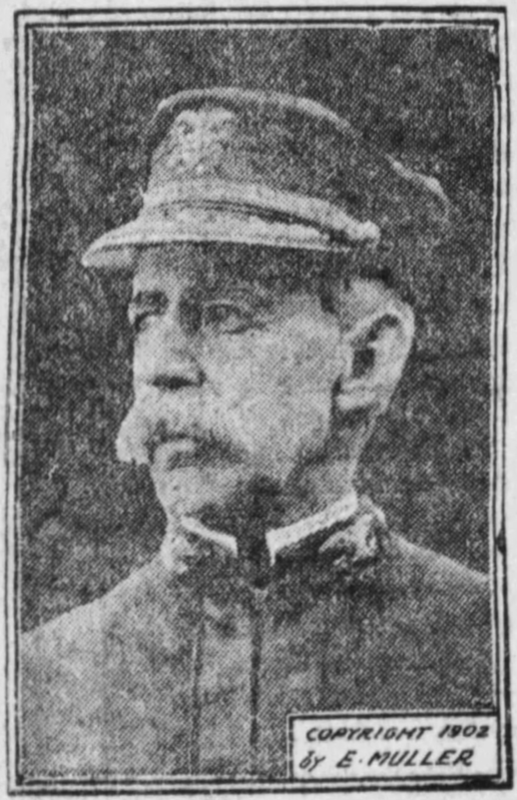 On January 21st 1895 Commander Snow was transferred to the 3rd Lighthouse district where he served as the instrument Inspector until he was transferred on December 1897. 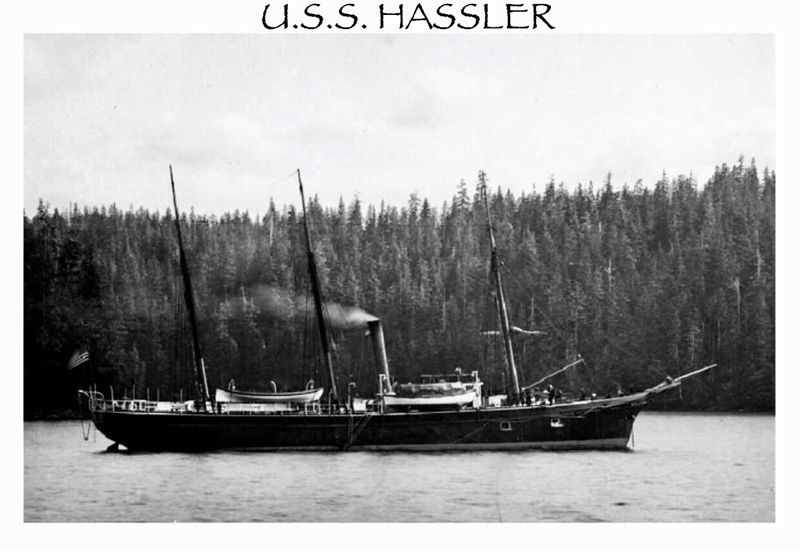 ​On April 16th 1898 Commander Snow was transferred to the screw steamer Yumuri, built in 1889 in Chester, Pennsylvania, by John Roach & Sons, it was purchased by the Navy on April 19th 1898 from the New York and Cuba Mail Steamship Lines. 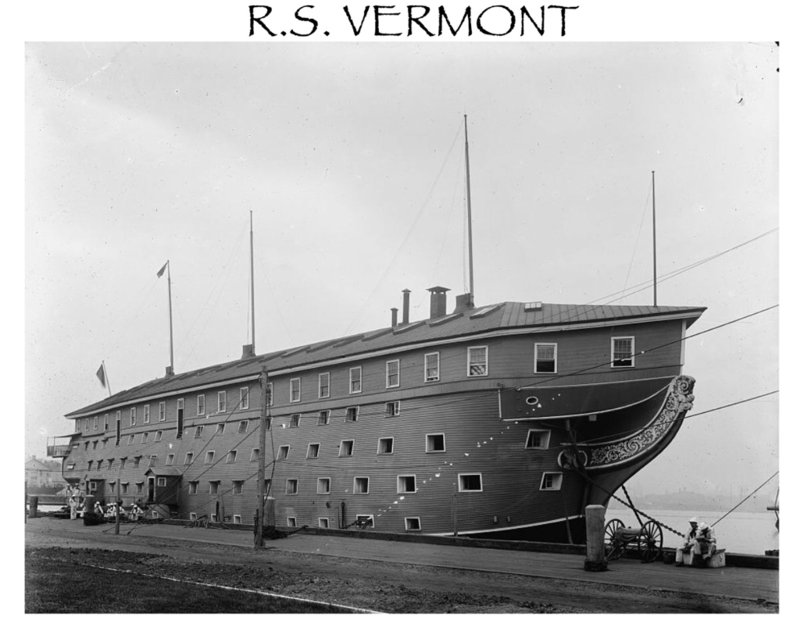 The Yumuri was converted to an auxiliary cruiser and renamed U.S.S. 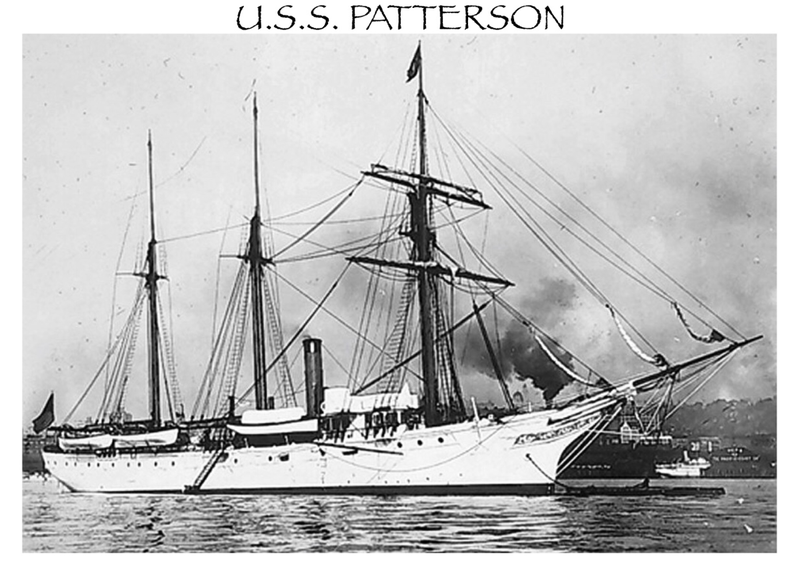 Badger, she was commissioned at the New York Navy Yard on April 28th 1898 with Commander Snow at the helm. Early in June, U.S.S. 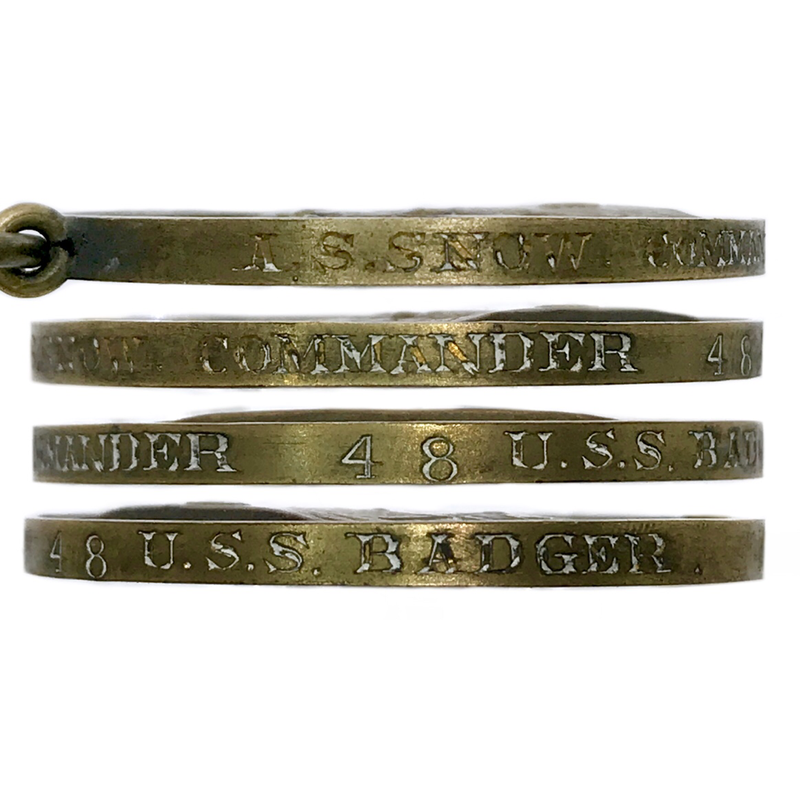 Badger began patrol duty along the New England coast between Provincetown, Mass., on the tip of Cape Cod and Bar Harbor, Maine. The U.S.S. 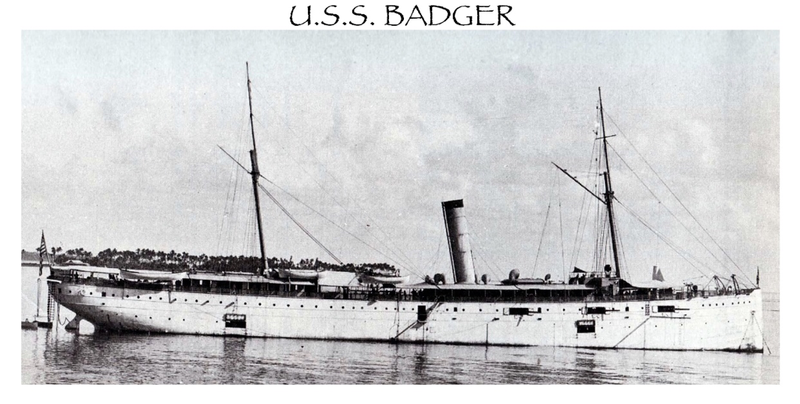 Badger departed Portland, Maine, on the 26th to join the forces blockading Cuba. 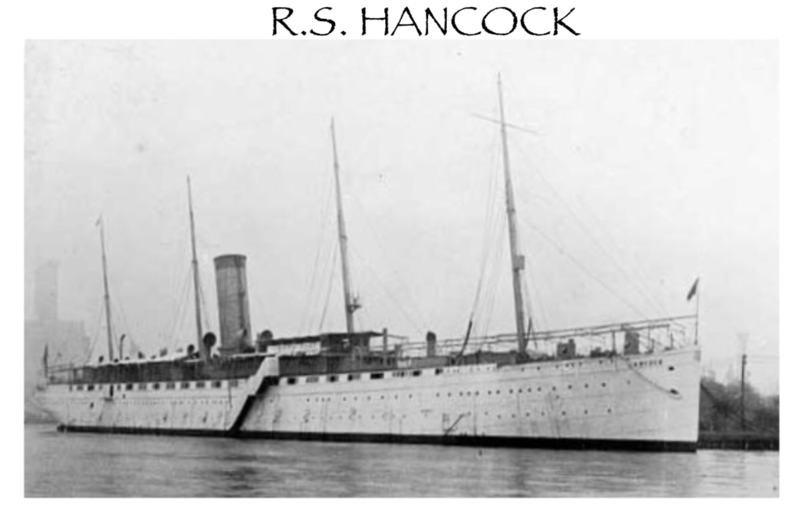 She arrived at Key West, Florida, on July 1st and remained there for two days; and then joined the North Atlantic Squadron off Havana on Independence Day 1898. After a week off that port, she moved to a new blockade station at Nuevitas located about two-thirds of the way down the northern coast of Cuba from Havana. The U.S.S. Badger’s blockade patrols proved uneventful for the first 2 weeks as Spanish forces were becoming increasingly desperate to escape Cuban insurgents by eluding the blockade. Then, at about 3:40 p.m. on July 26th, she encountered and intercepted a motley convoy of three Spanish vessels, the steam tug Humberto Rodriques towing the former steamer San Fernando and the brigantine Safi, attempting to flee Port Nuevitas. In addition to the Spanish ensign, each ship flew the Red Cross flag while the two vessels in tow also flew the quarantine flag. Commander Snow ordered a blank round be fired to persuade the fleeing vessels to heave to. He then sent a boarding party on board the tug, who ascertained no justification for the use of the Red Cross and quarantine flags. The U.S.S. 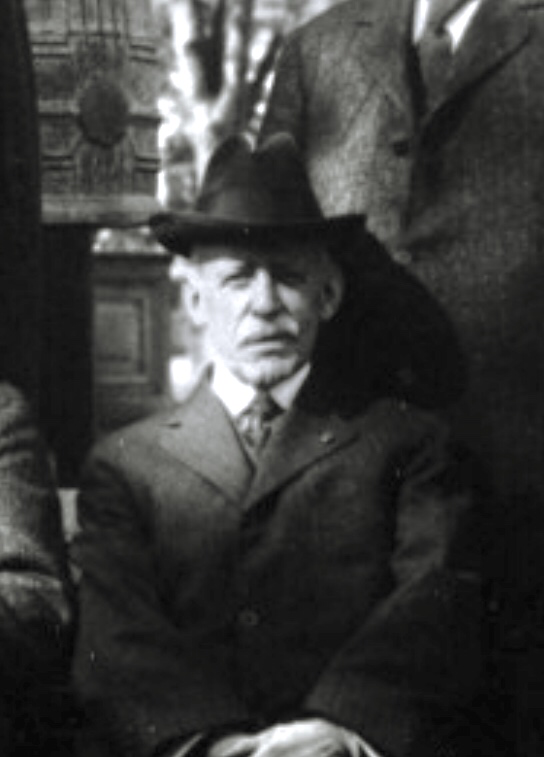 Badger’s surgeon, Maxwells S. Simpson, quickly determined that the entire operation was a ruse and the Spanish troops were taken prisoner. 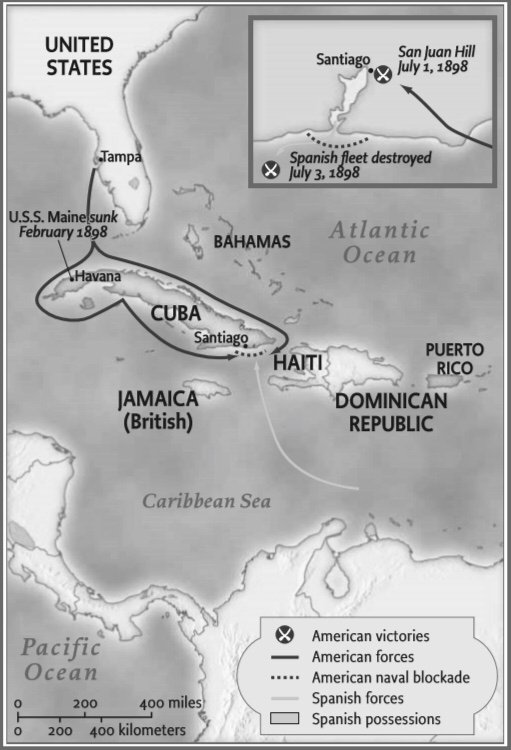 Consequently, Badger took the 3 Spanish ships as prizes and set out for the Dry Tortugas quarantine station, where she placed the 399 prisoners on board San Fernando and Safi, and Humberto Rodriques towed them to the blockade lines off Havana. Completing that mission, the tug's prize crew set a course for New York. Meanwhile, U.S.S. Badger moved to Key West on August 3rd 1898 and spent four days taking on coal and provisions. On August 7th 1898, she got underway to resume blockade duty. 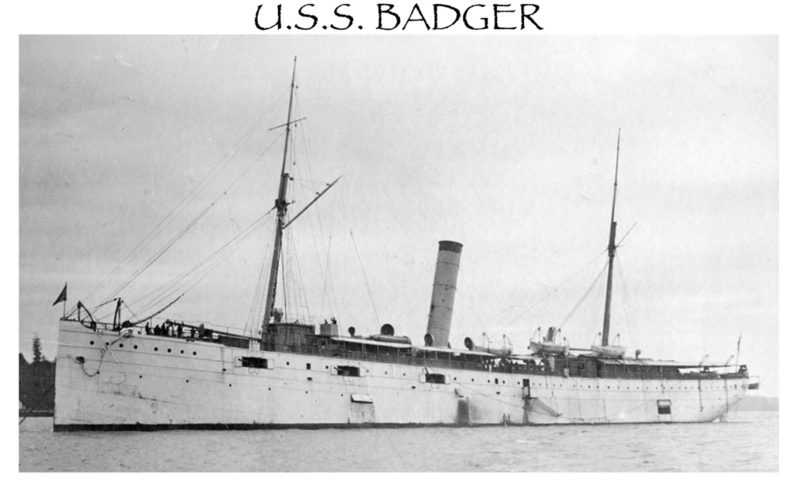 The auxiliary cruiser Badger arrived off Guantanamo Bay on the southern coast of Cuba, near the eastern end of the island, on the 9th. 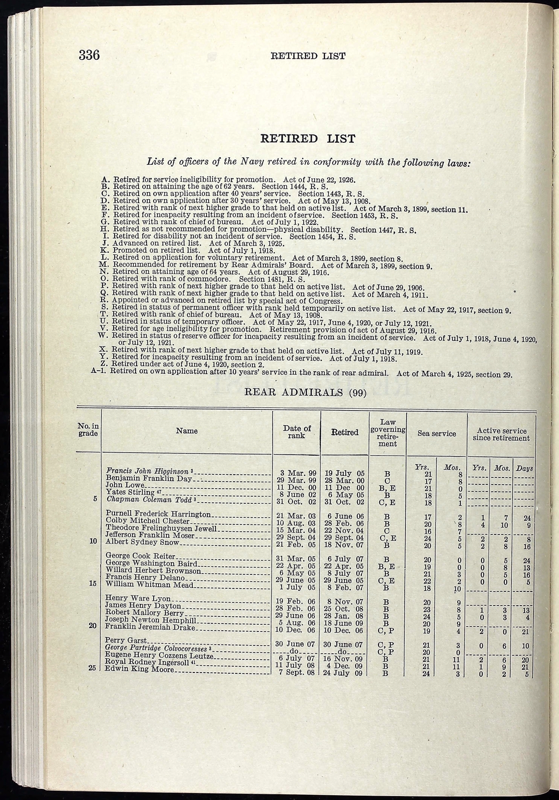 Hostilities ceased effectively in mid-August, and the auxiliary cruiser Badger departed Guantanamo on the August 18th. 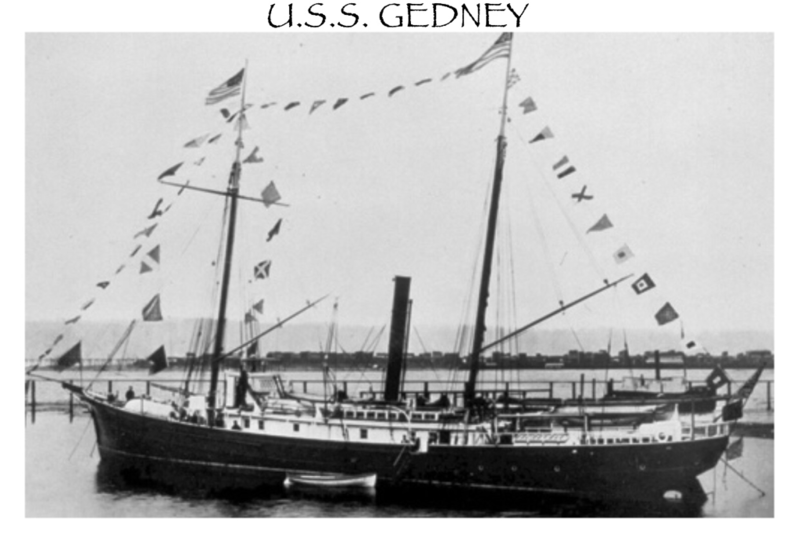 She arrived back in New York on August 23rd 1898 and moved then to Boston, where her crew of volunteers was mustered out of the service. Commander Snow was transfer from the U.S.S. Badger on August 27th 1898. 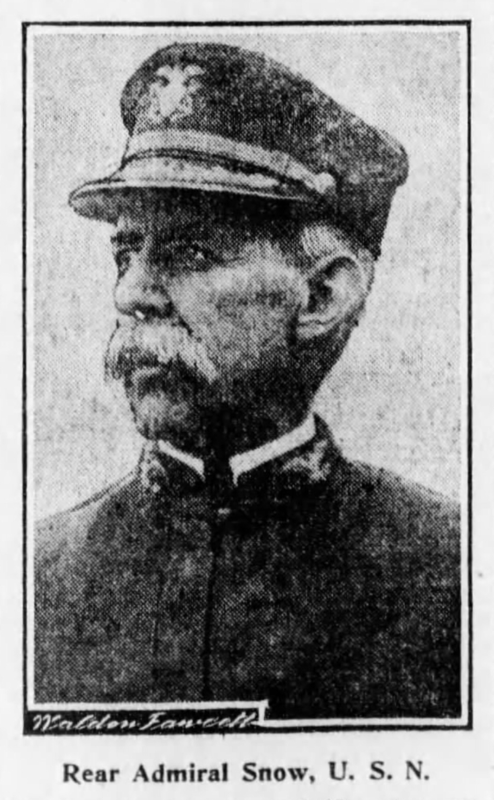 Commander Snow was temporarily in charge of the Naval Station Port Royal from Sept 15th through the October 7th 1898 when his appointment was revoked. He was the put in Command of the Naval Station, San Juan Harbor, Puerto Rico aboard the Hospital ship U.S.S. 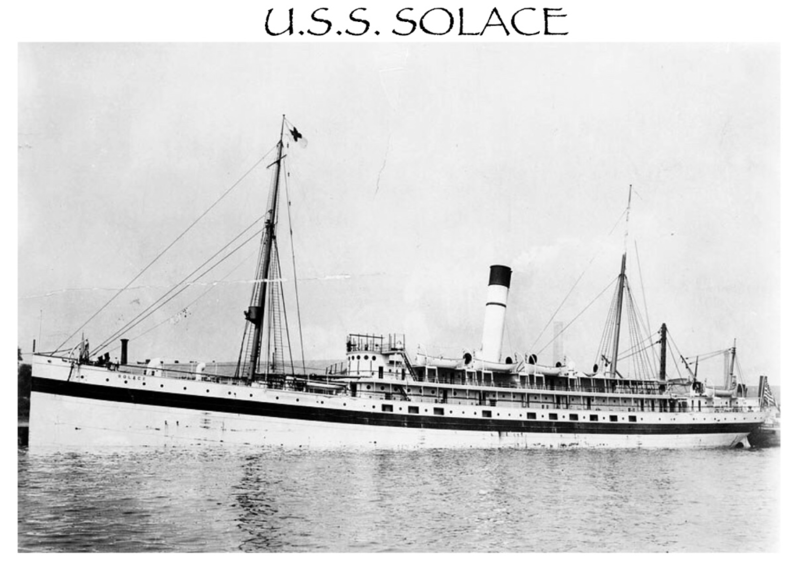 Solace on October 20th 1898 and then the U.S.S. 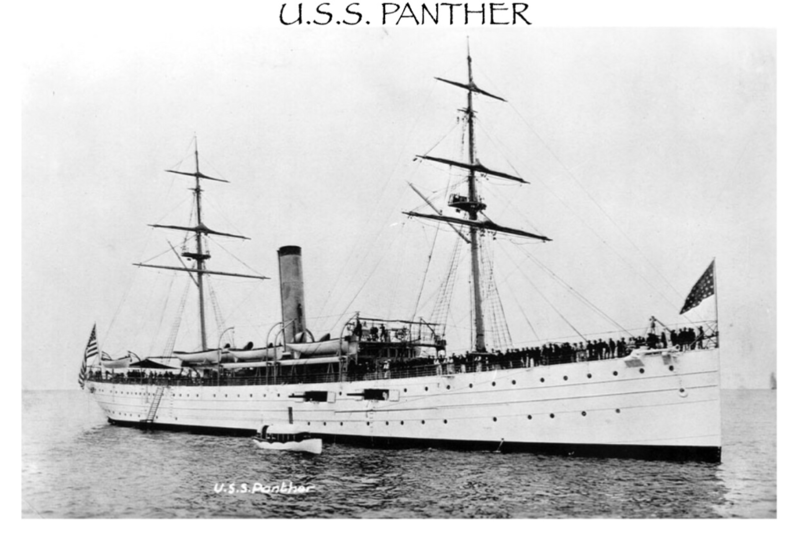 Panther on December 6th 1898. 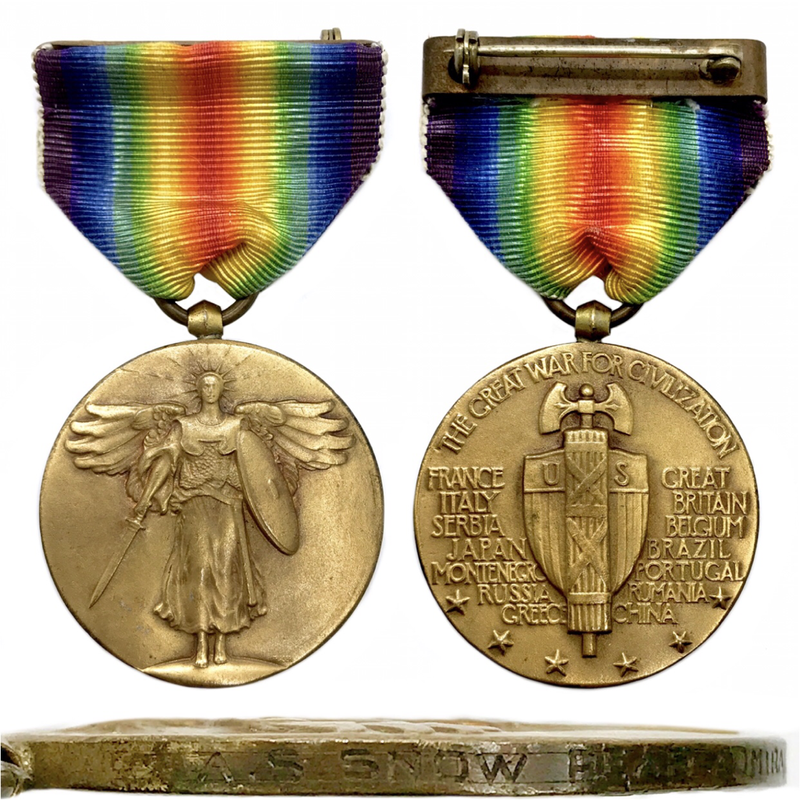 Commander Snow was transferred back to the United Stated on March 2nd 1899, concluding his service in the Spanish American War. 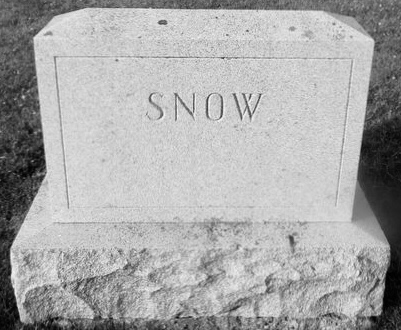 ​For Commander Snow's service aboard the U.S.S. 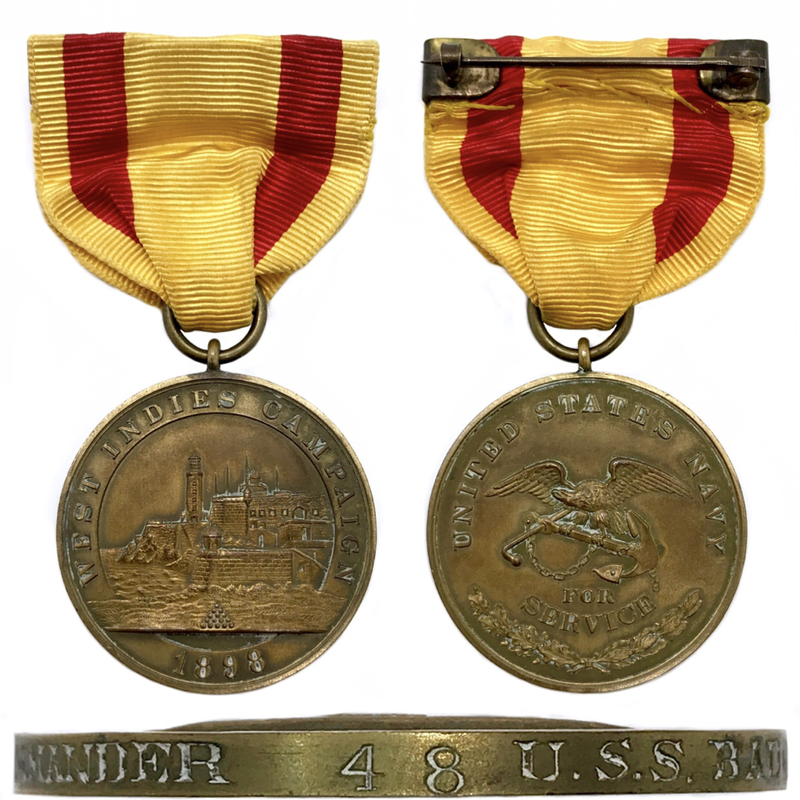 Badger during the Spanish American War, he was issued West Indies Campaign Medal #48. 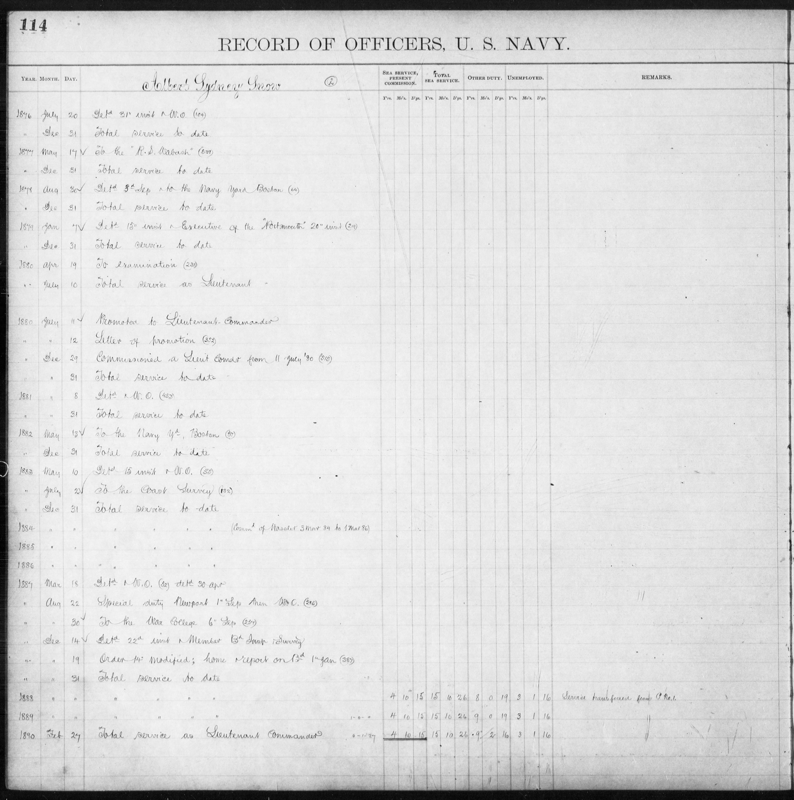 ​of the Naval Academy Station on December 14th 1899. 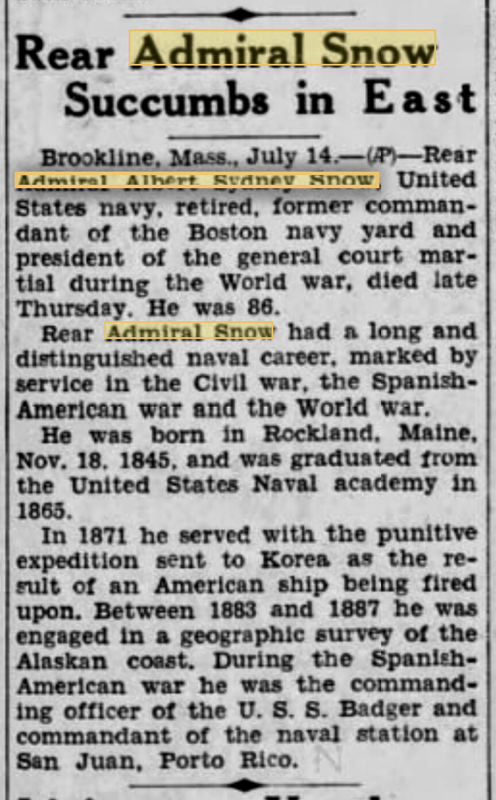 On January 29th 1900 Captain Snow sailed the U.S.S. 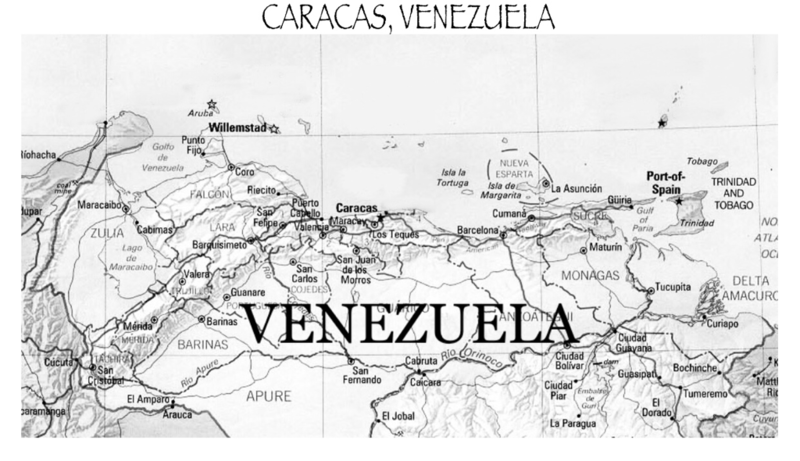 New York to Caracas Venezuela during civil unrest in the country. Captain Snow was detached from the U.S.S. 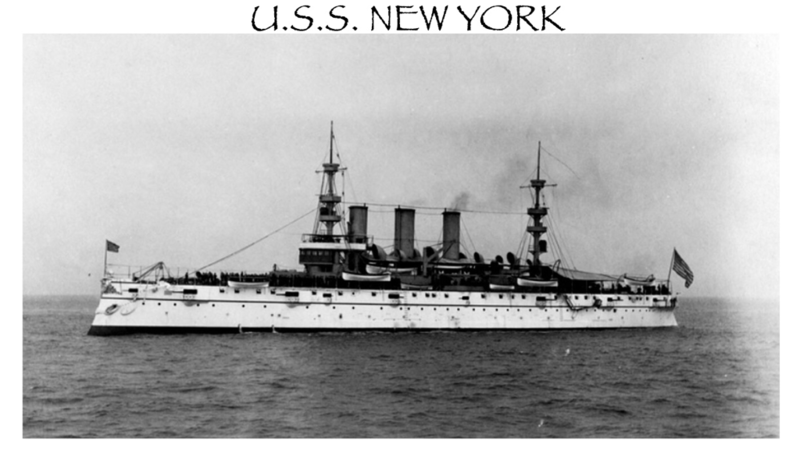 New York and transferred to the New York Naval Yard on November 1st 1900. 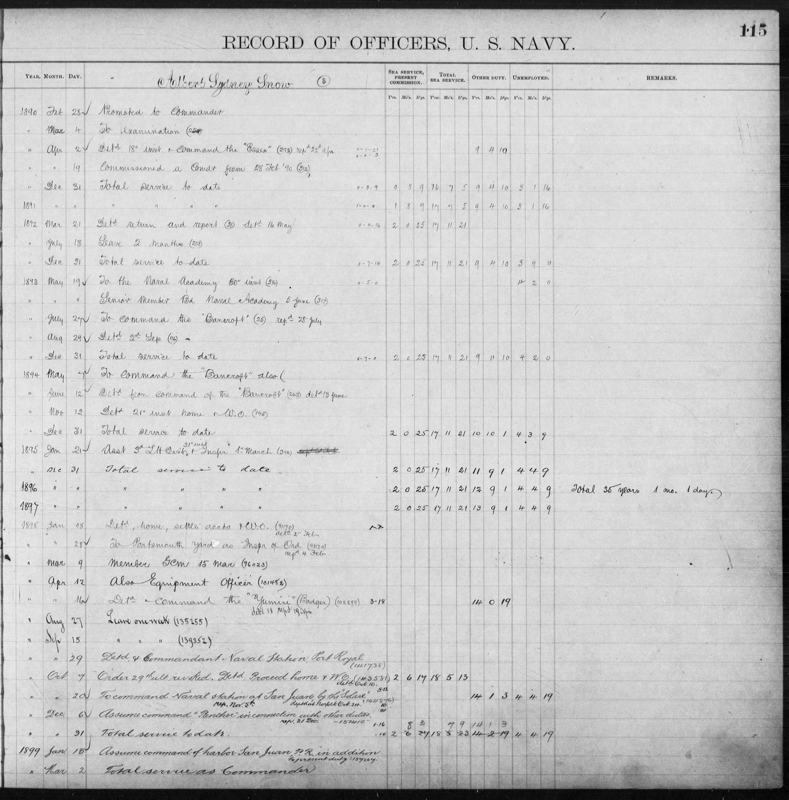 ​Captain Snow was appointed to the Retirement Board at the New York Naval Yard on January 13th 1902. 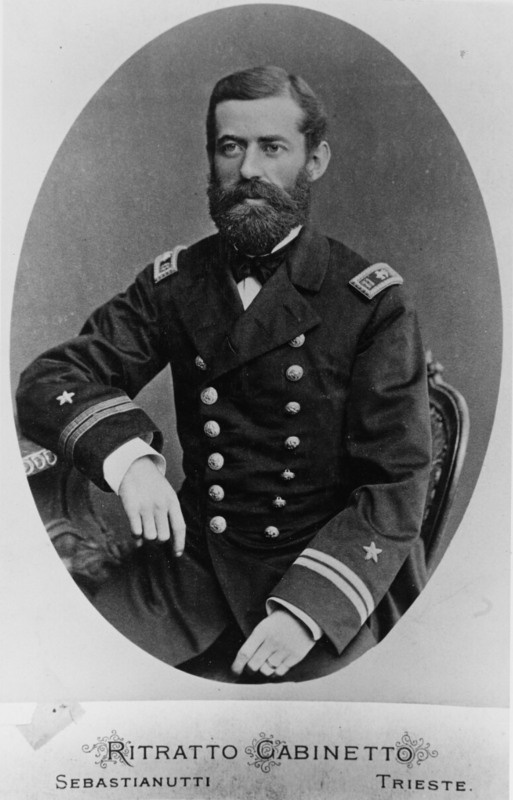 He played an important roll in the passage of the Naval Personnel Act, a measure drafted by the assistant Secretary of the Navy Theodore Roosevelt. 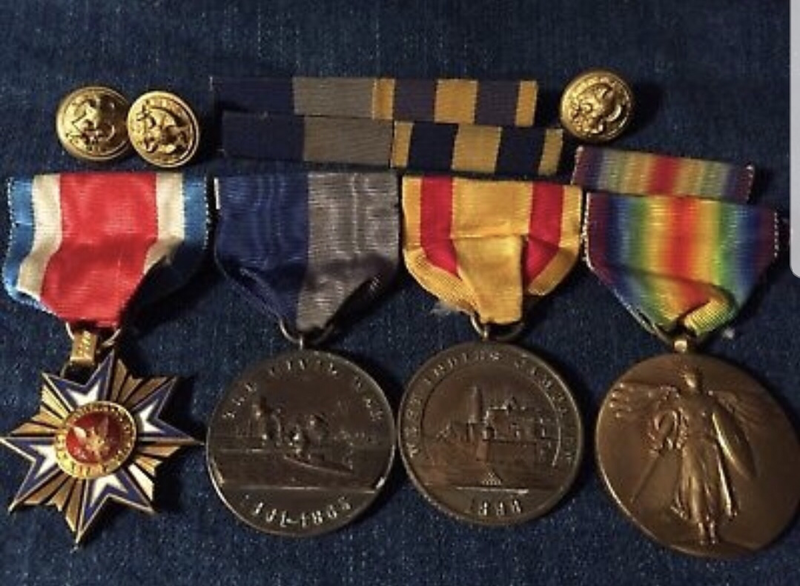 The remarkable experience of Captain Snow who had a son in the Navy at the time who’s salary was greater than his own had a great deal to do with introducing Congress to reorganize the Navy. The white haired Captain was drawing about $2,500 a year while his son a recent Naval Academy graduate was drawing in $2,600 a year. 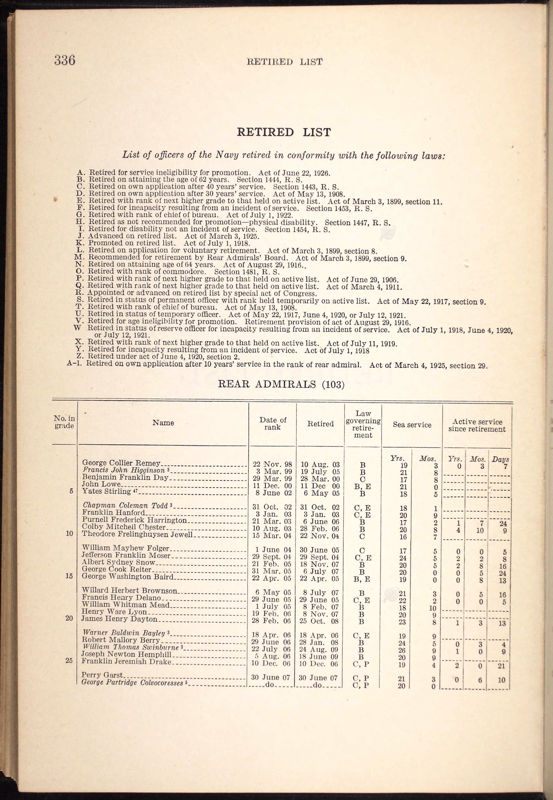 The future President Roosevelt cited Captain Snow’s case as illustrating the inequalities of pay in the Navy. Captain Snow was appointment to the General Court Martial at the N.Y. Naval Yard on October 27th 1902. 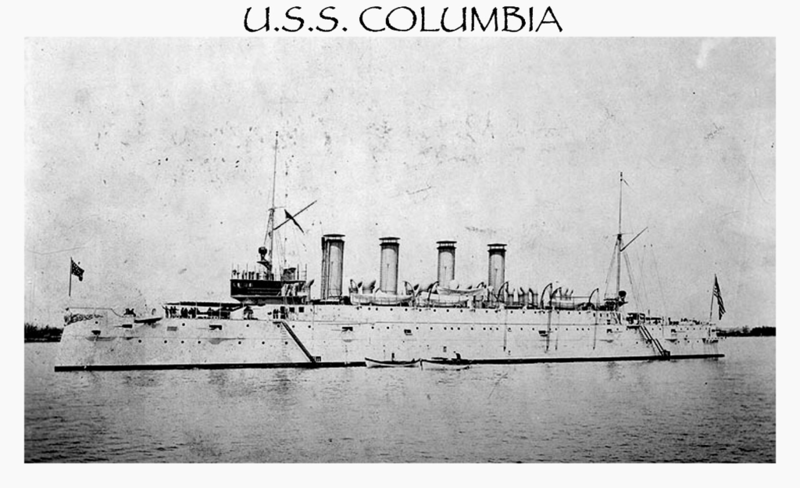 ​From July 29th 1903 to December 31st 1903 Captain Snow Commanded the Receiving Ships Hancock & the Receiving Ship Columbia while they were recommissioning to active duty. ​ He was placed on leave at home until his next command. 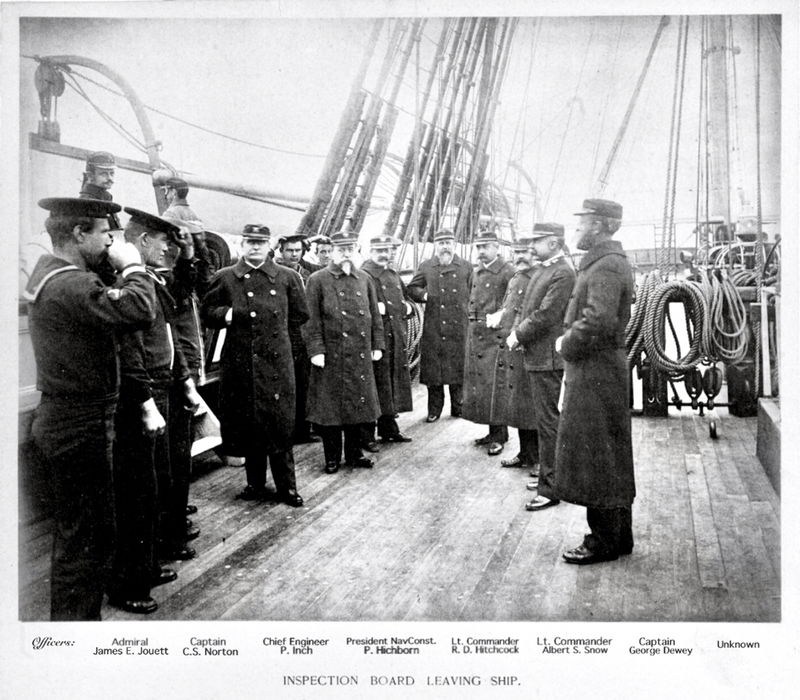 Captain Snow was appointed a member of the Court of Inquiry at the Naval Yard, New York on January 16th 1904. 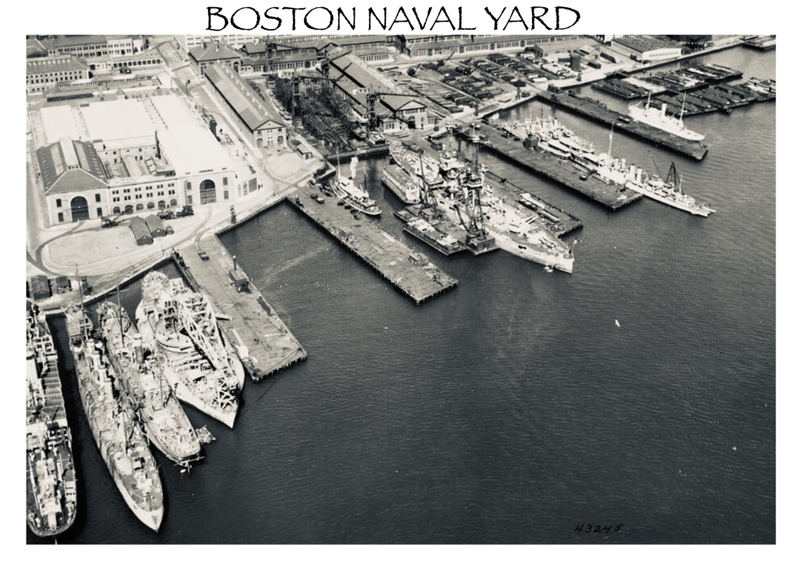 On February 3rd 1904 Captain Snow was transferred to the Boston Naval Yard where he took Command of the Yard until he was transferred to the Portsmouth, Naval Yard New Hampshire. 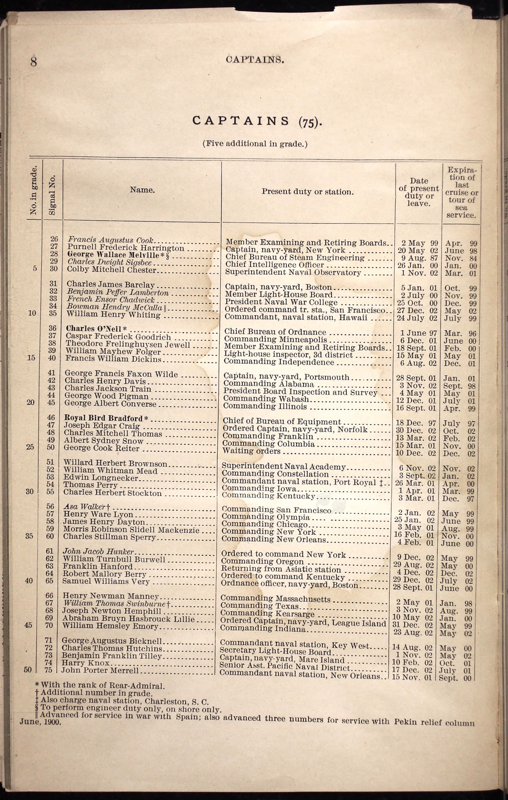 He was appointed President of the Court if Inquiry on December 30th 1904. 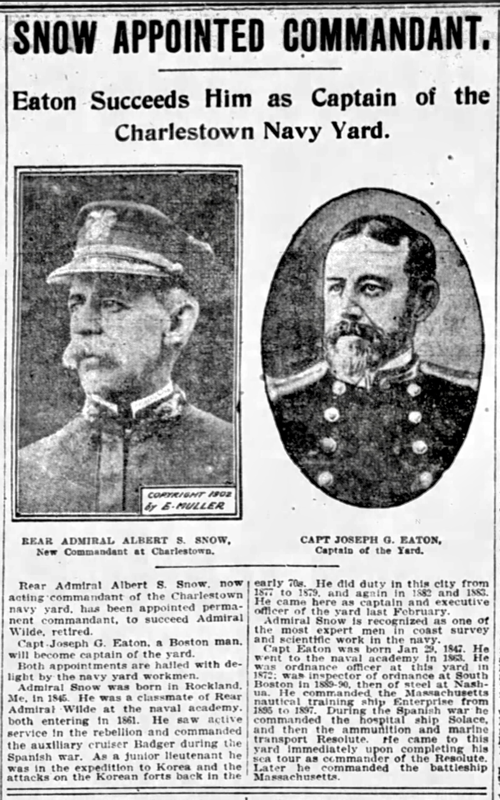 On February 21st 1905 Captain Snow was promoted to Rear Admiral and took back his Command of the Boston Naval Yard. 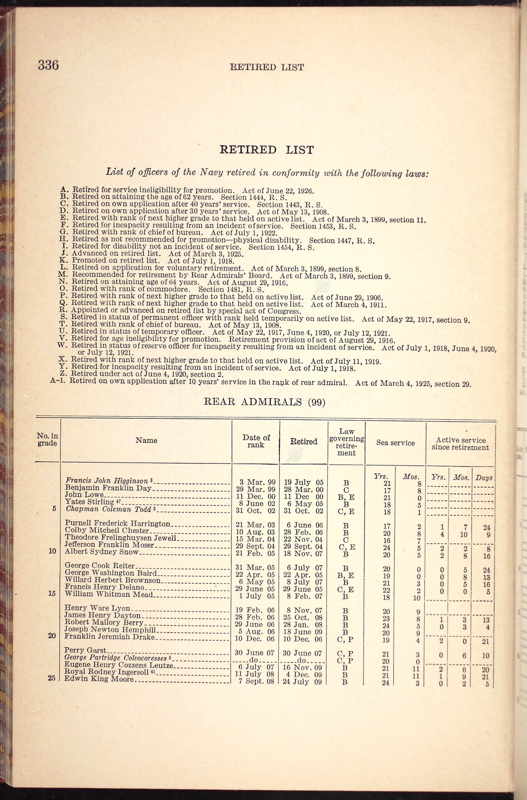 He was appointed board member of the selection for retirement, Navy Department on June 1st 1905. 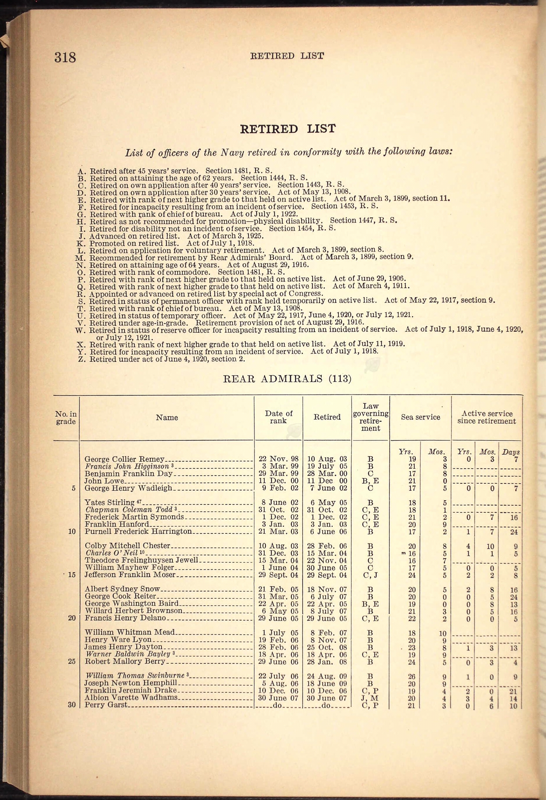 He was appointed Rear Admiral of the “Senior 9” on July 14th 1906 where he served until December 31st 1906. 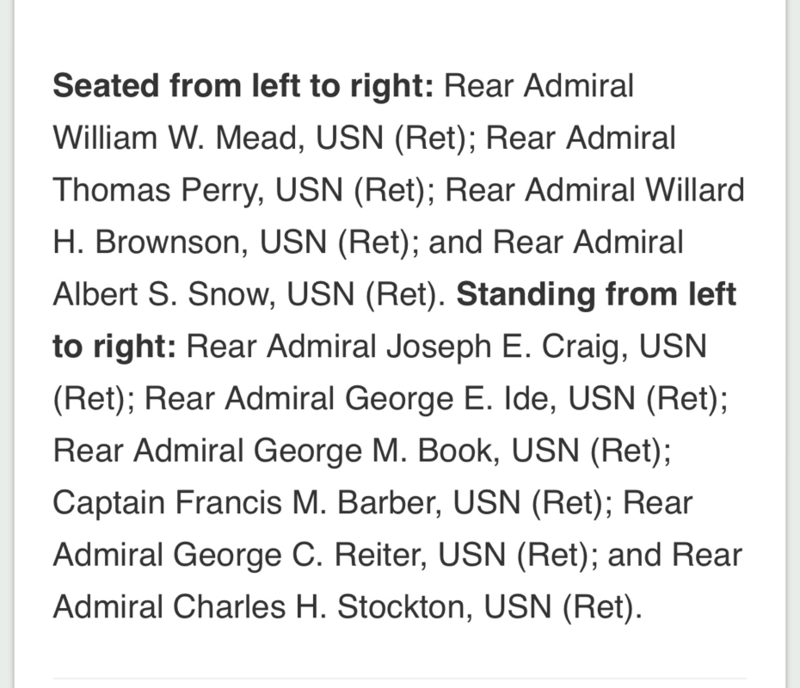 ​ Admiral Snow was appointed President of the Court Martial aboard the U.S.S. 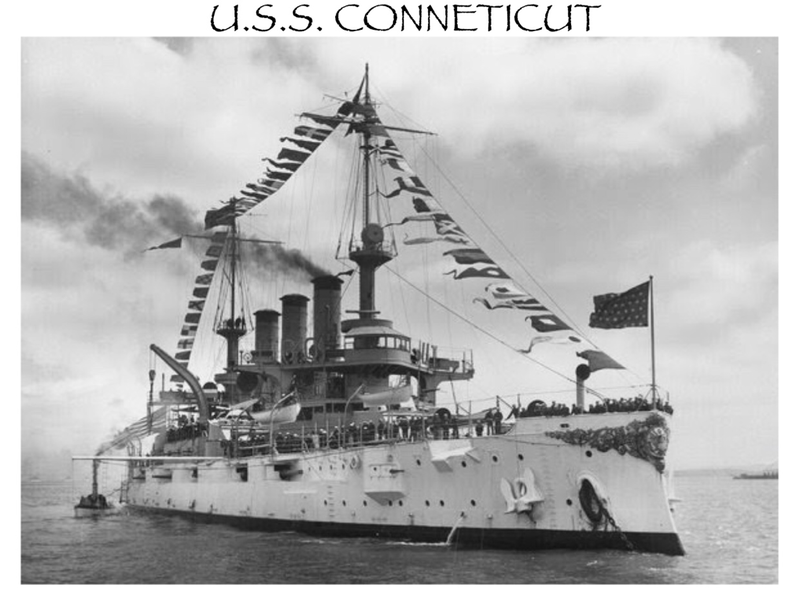 Connecticut at Hampton Road, Virginia on March 19th 1907. 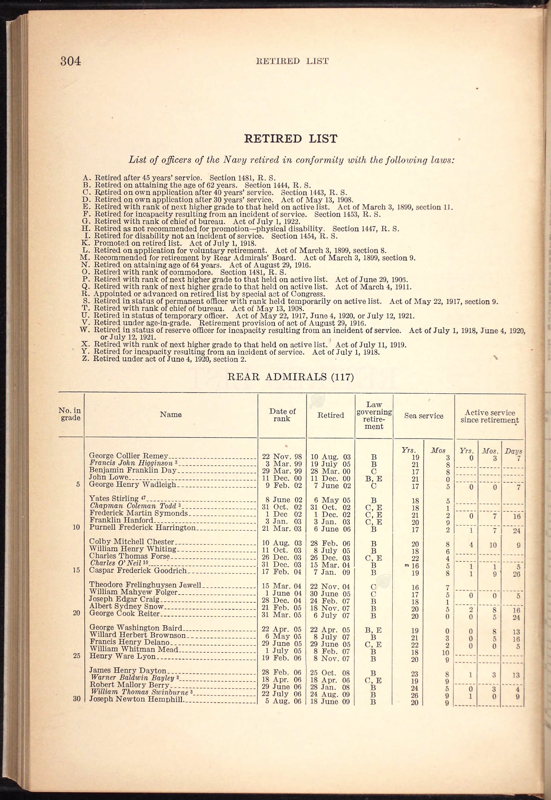 He was transferred to the retirement list for age on December 31st 1907. 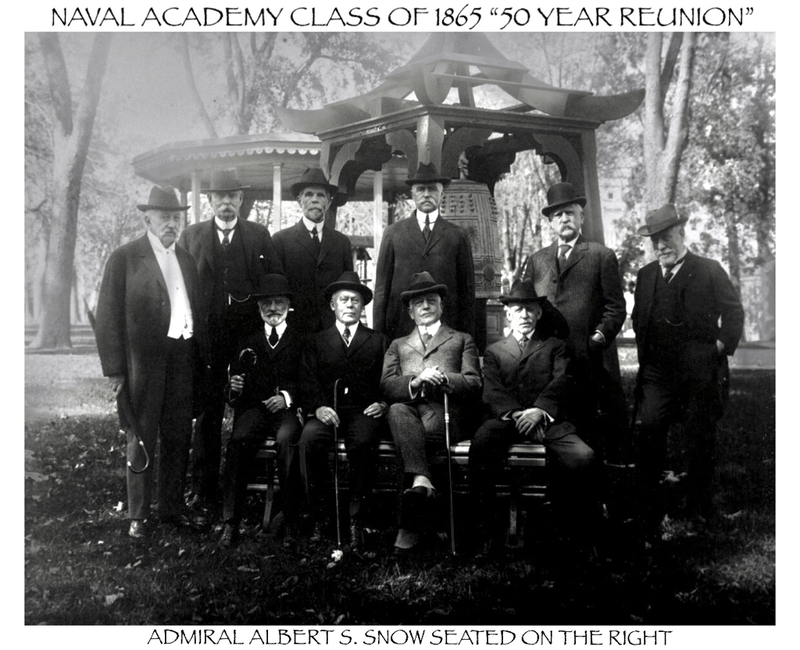 Retired Rear Admiral Snow attended the Naval Academy Class of 1861’s 50th reunion on October 27th 1915 at the Naval Academy. 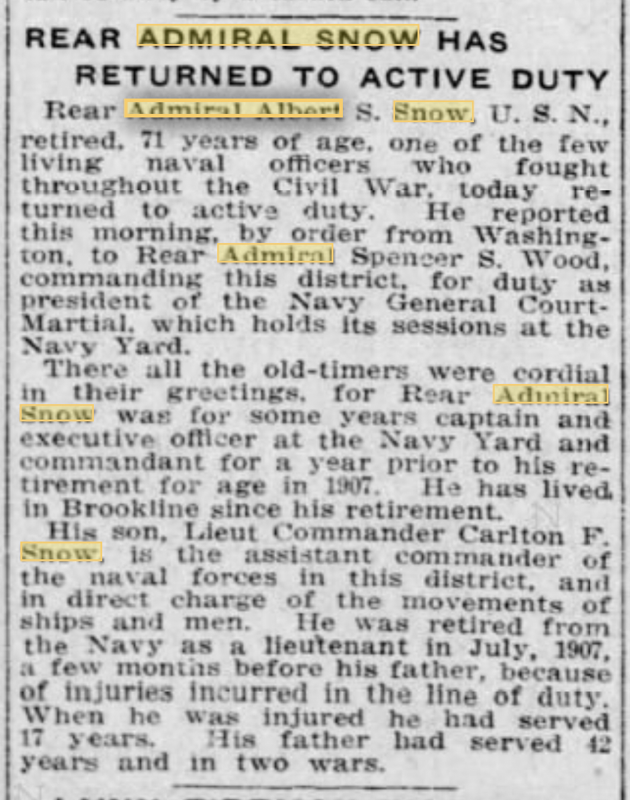 After nearly 10 years of retirement under his belt Admiral Snow was recalled by Washington D.C. for active duty on July 15th 1918 at 71 years old. 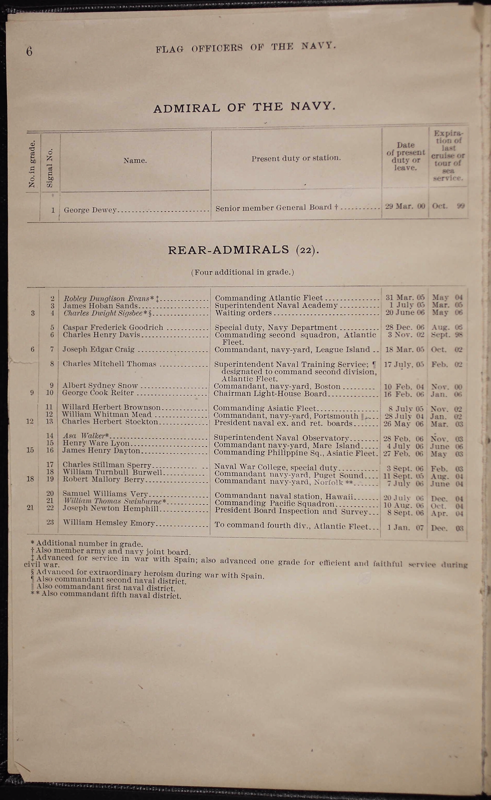 On November 4th 1918 Admiral snow was appointed President of the General Court Martial at the 1st Naval District, Boston Naval Yard. 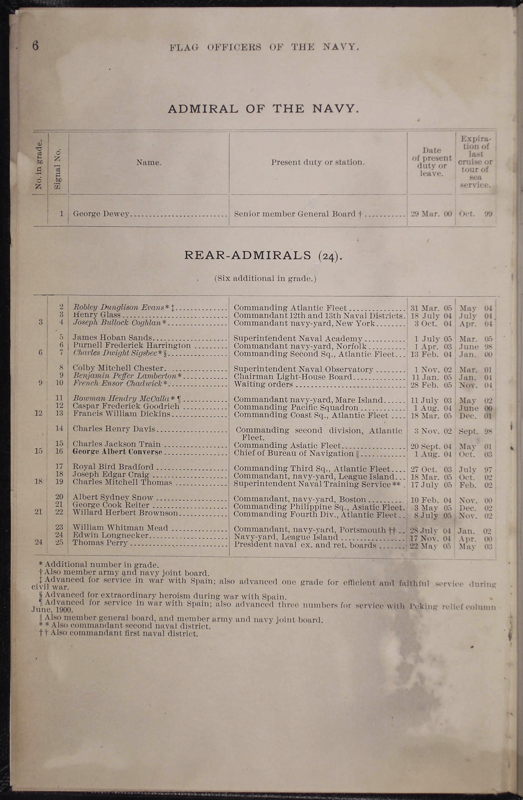 He was appointed President of the Naval Retiring Board on November 15th 1919. 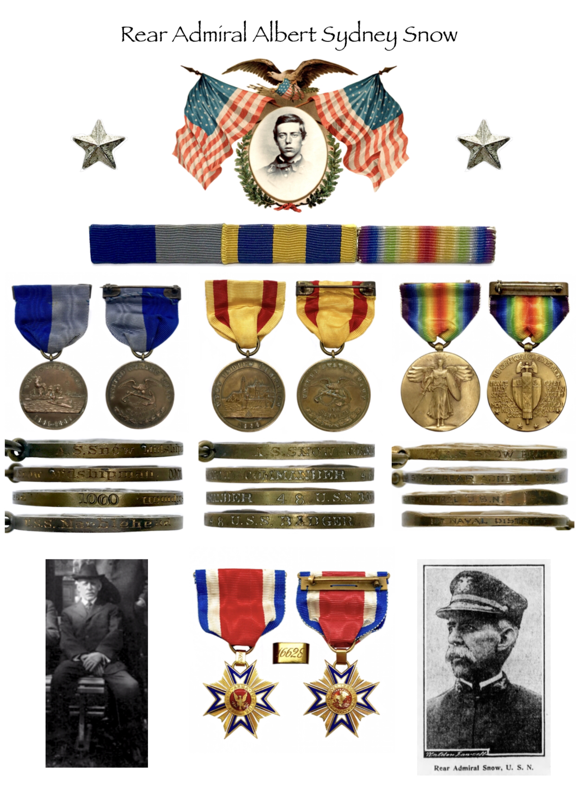 He held both positions until his retirement from the Navy on July 21st 1921 after 50 years of active service (20 years at sea) over a career spanning 60 years and 3 wars. 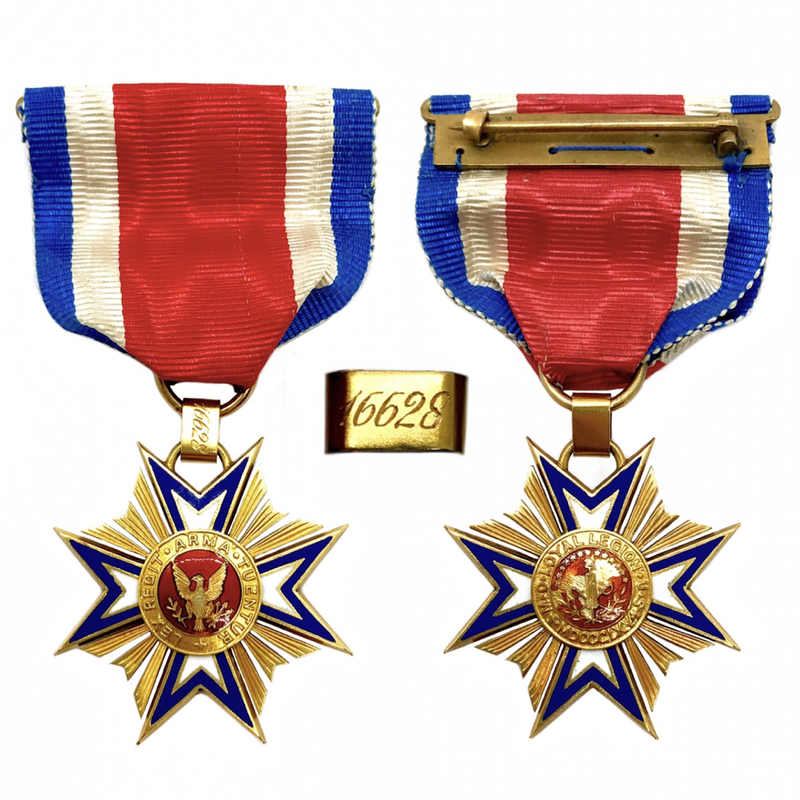 Admiral Snow was a member of the Maine Commentary of the Military Order of the Loyal Legion of the United States, he was issued this 14k gold badge #16628. ​86 years old after losing a long battle of bladder cancer on July 14th 1932 at the Corey Hill Hospital. 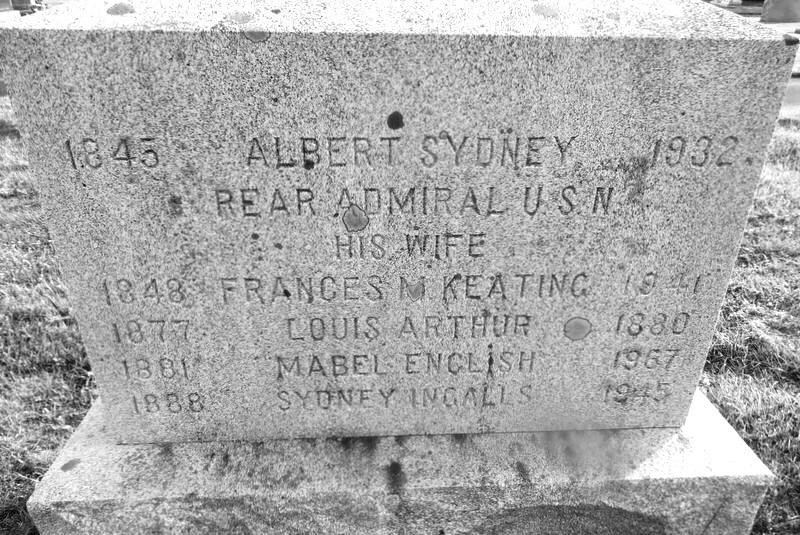 He is buried at the Achorn Cemetery, Rockland, Knox County, Maine. 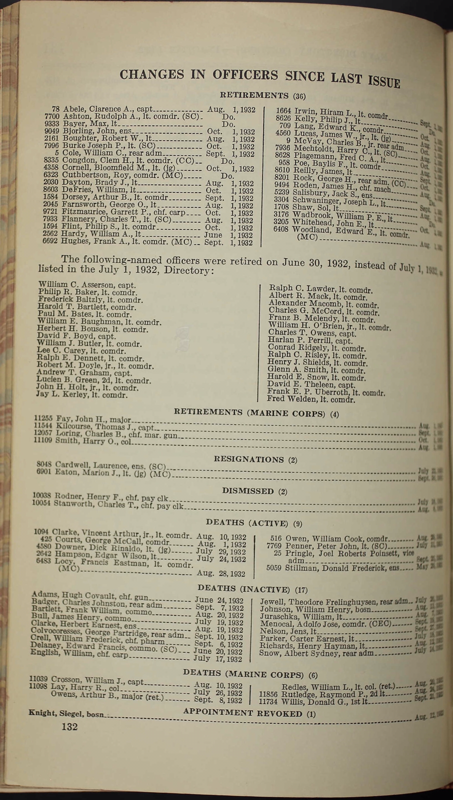 An entire battalion of Coast Artilleryman led by Major Ralph W. Brown marched to Achorn Cemetery to give the Admiral his full military honors of a 21 gun Salute and the sounding of “taps”.